We have been taking it pretty easy since we returned. I did the laundry and we went to the store to stock up on food and wine. We are embarking on a diet so I wanted to get healthy things to eat. I want to cut down on our favorite thing to eat…pasta! At our local Coop they had a sale of the bright yellow chickens that they have here. I had never bought nor cooked one since we’ve been here. There is one disadvantage to these birds and it will be obvious to you when you see his picture. I don’t really understand why they feel they must leave everything on the bird. I am sure no one eats the head and feet! I chopped off those bits with a cleaver. I particularly hate doing that part. Once I had him looking good I followed a recipe I found on the internet. I chopped up a bunch of onions and used them as a bed for the chicken. 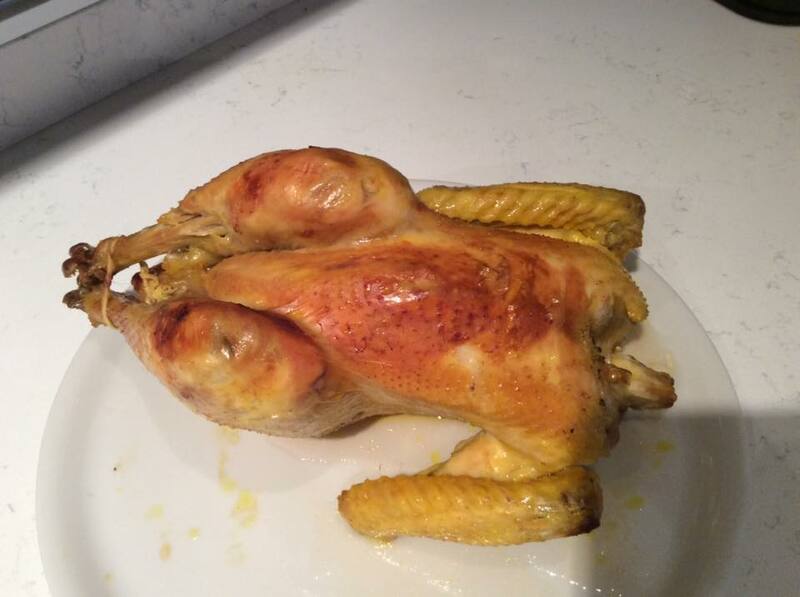 I placed him breast-side down and sprinkled liberally with salt. Then I roasted him at 350 F for 20 minutes with the top on the pot. Then I raised the temperature to 400 F and took the top off and roasted him for 25 more minutes. Finally I flipped him over and continued roasting for another 30 minutes. He got nice and brown and the onions had absorbed the chicken juices. I just needed to caramelize them a bit more. He turned out tasty and tender. 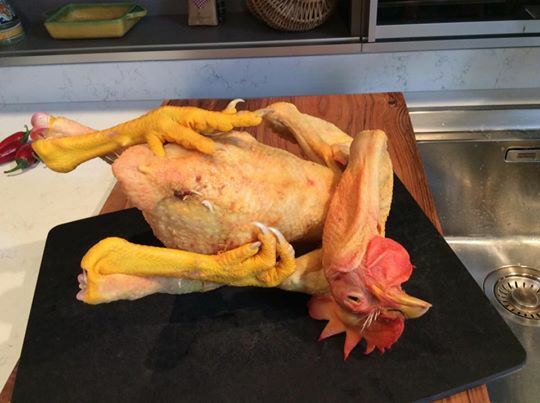 I discovered that this type of chicken had very little breast meat. Here is the finished product. 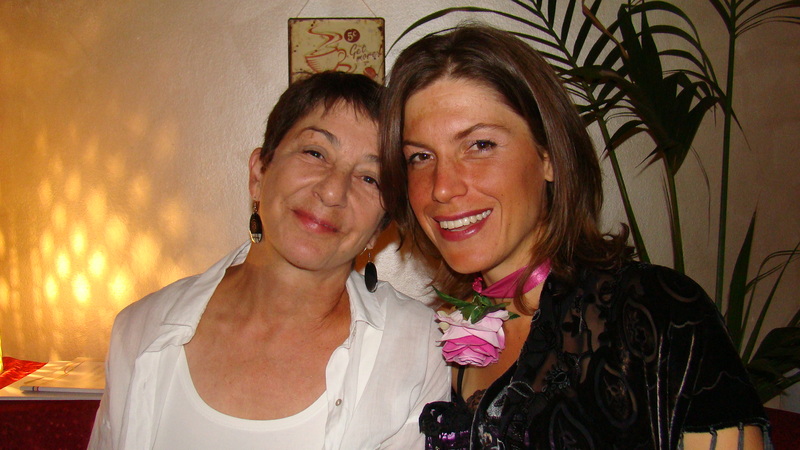 This entry was posted in cooking, Eating, everyday life in Umbria, Uncategorized on September 27, 2015 by Nancy Hampton. 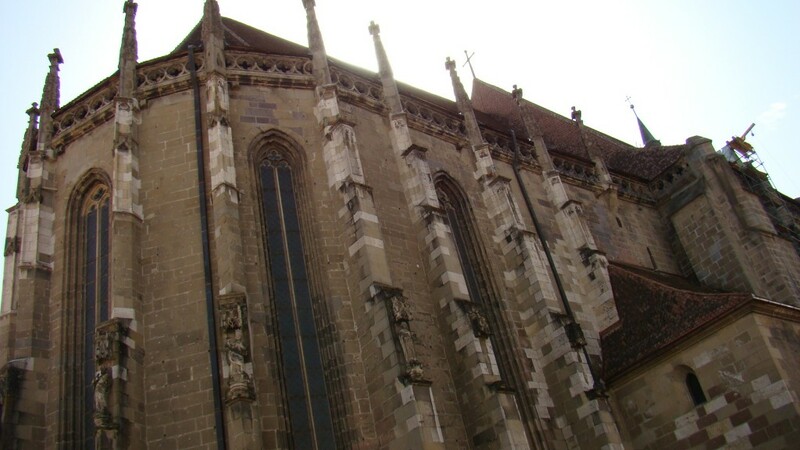 I learned a bit about the history of Transylvania today. 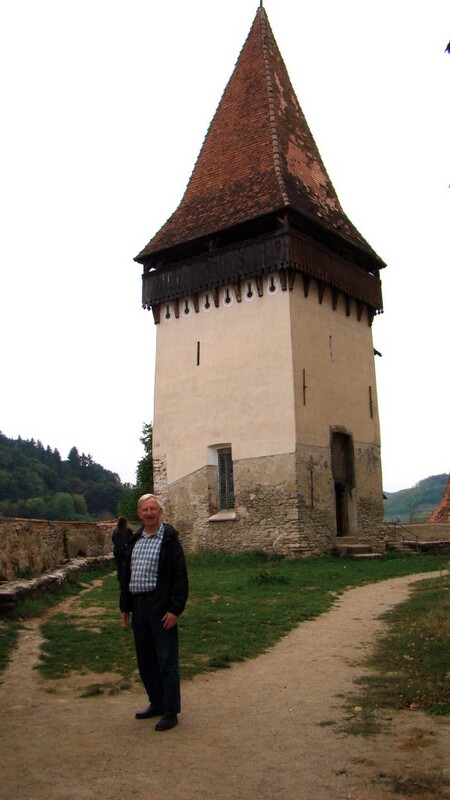 We traveled the small roads south of Sighişoara to see some castles and fortified churches. As in much of Europe what is now Romania was not always Romania. It was part of the Ottoman Empire in the 1600s and later became part of the Austro-Hungarian empire until just after World War One when there was a lot of redrawing of borders and land grabs. Many Germans (Saxons) came during the Austro-Hungarian rule. 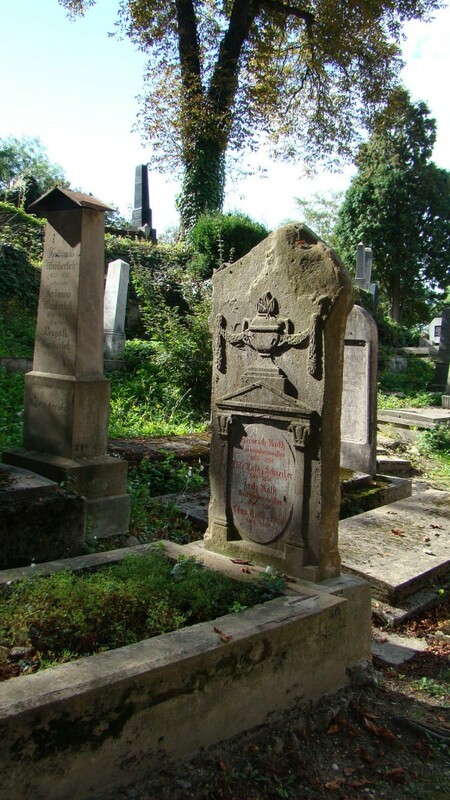 They brought along Protestant religions primarily Lutheran. 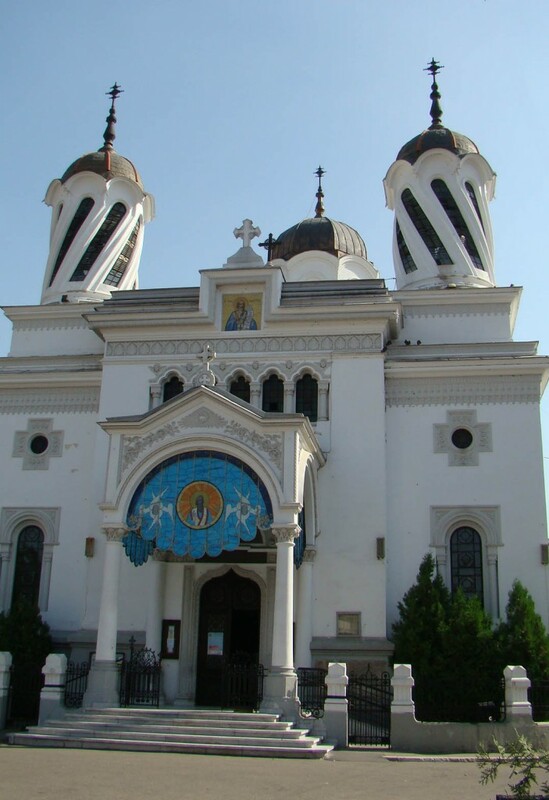 The Romanians were Eastern Orthodox. This happened primarily in southern and western Transylvania. 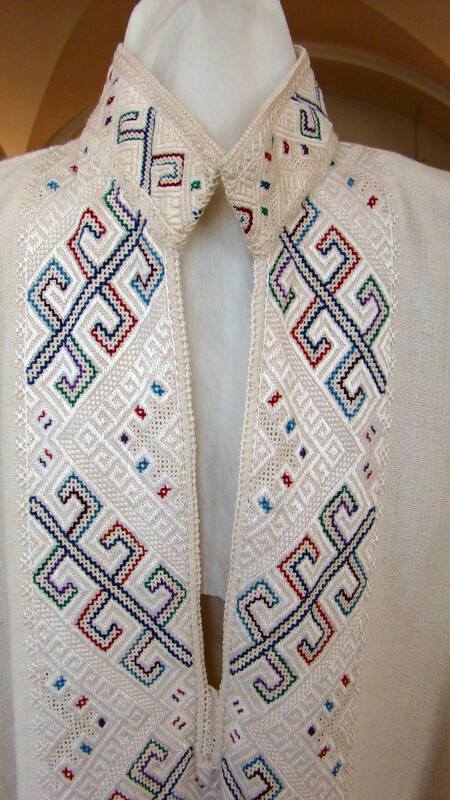 The northern part was primarily Hungarian. 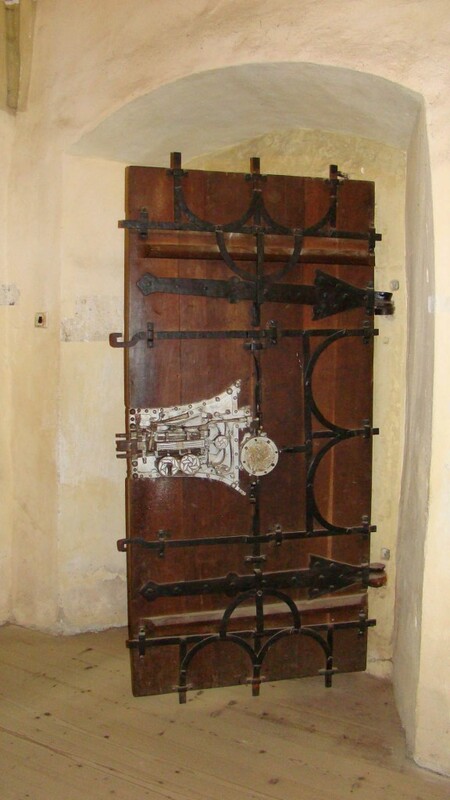 The protestants built churches and fortified them with walls. 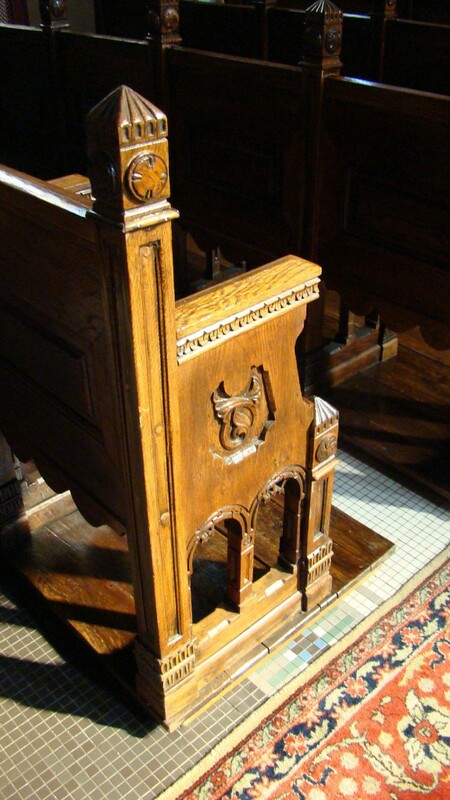 They became a place for the congregation to retreat in times of trouble. I guess it was a threatening place. 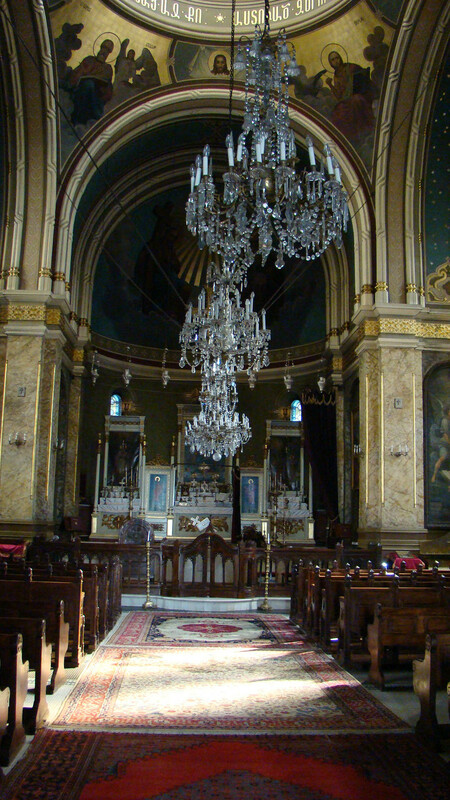 We toured many of these churches and fortifications. Along the way we observed the way of life. 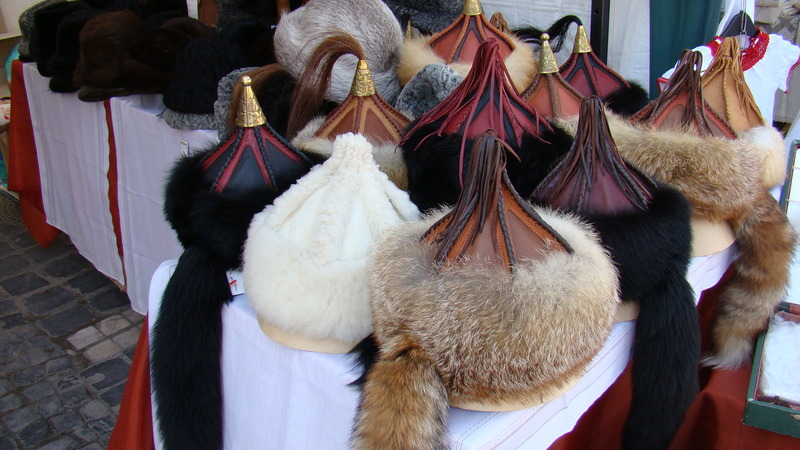 Many of the people still wear the traditional consumes. 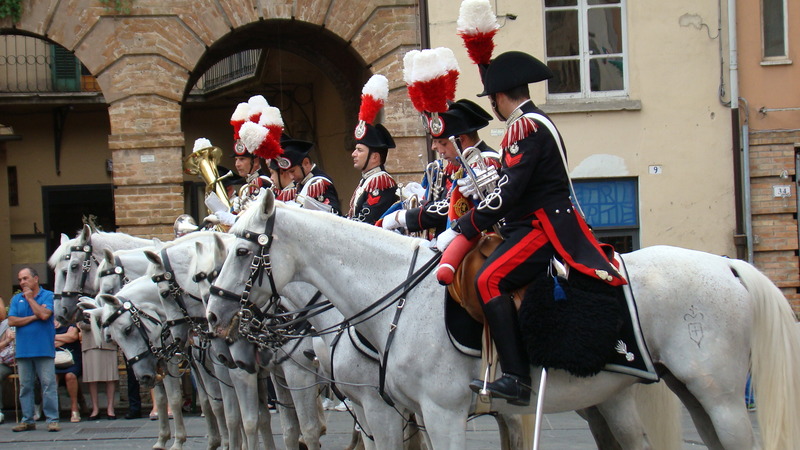 There are numerous horses being ridden as transportation or pulling carts. Sometime we saw mares harnessed to carts with their foals teathered to their moms. Everywhere we went they spoke German. This was handy since we speak that language. The architecture is also heavily influenced by the Germans. 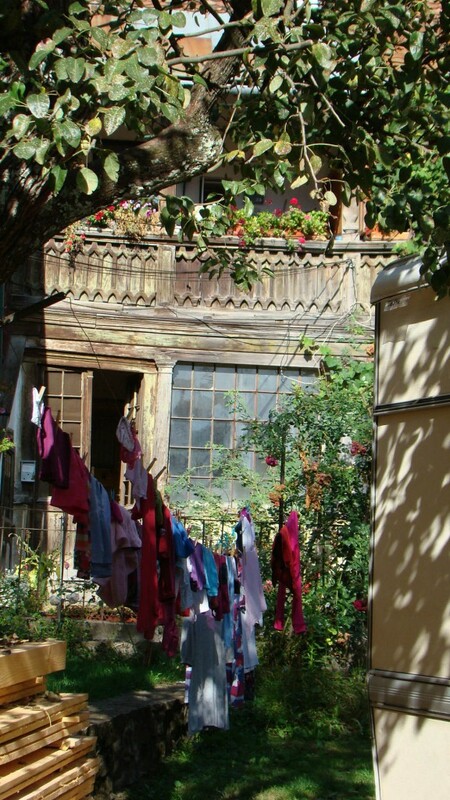 The many villages we traveled through were poor but they painted their houses bright colors. It made for some pretty sightseeing. Alas, the Germans are gone now. But we saw many, many travelers with German license plates. During the communist reign of dictator Ceausescu many Germans emigrated from Transylvania to West Germany. Ceausescu charged between 5,000 and 8,000 Marks per person in hard currency to let them go. The Germans come back now to where their families lived. Our first stop was Saschiz. 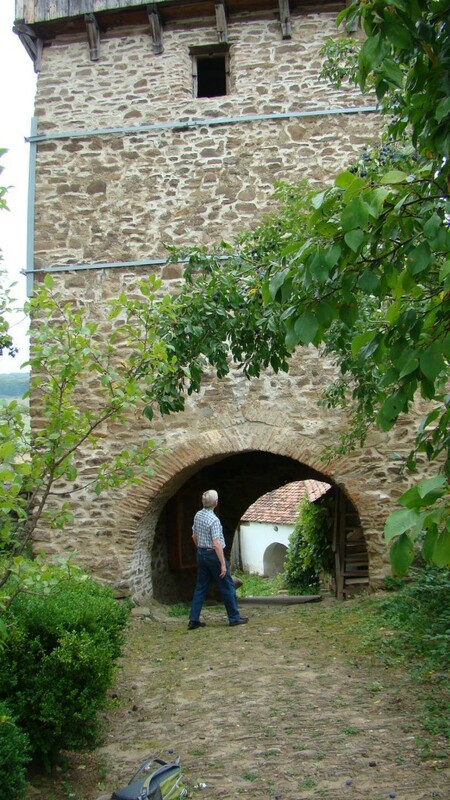 It had a huge medieval tower fortification next to the church. Notice the crack. It went from top to bottom and each side had a similar one. There was a nice woman in the tourist information booth. She was helpful. 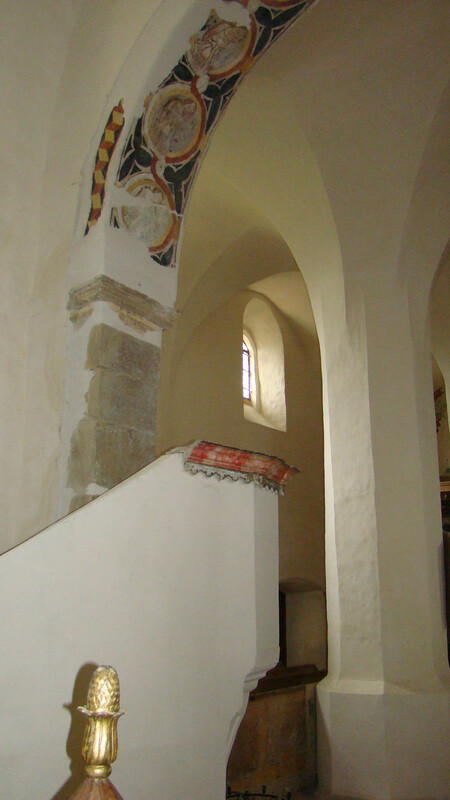 Inside the fortified walls was the church. We backtracked and took a yellow road on our map which was studded with the symbols for castles and churches. Not all were open…or restored. This one was watched over by a man who spoke German and let us in. It was being restored. Pretty. Tower fortification outside the above church. 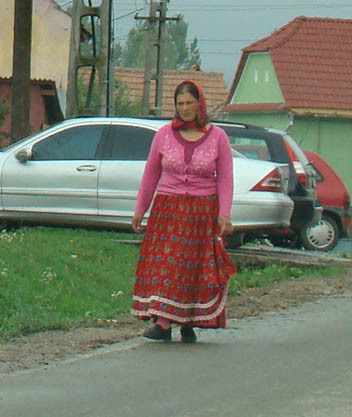 Here is a woman wearing the colorful costume of the Romanian peasant. 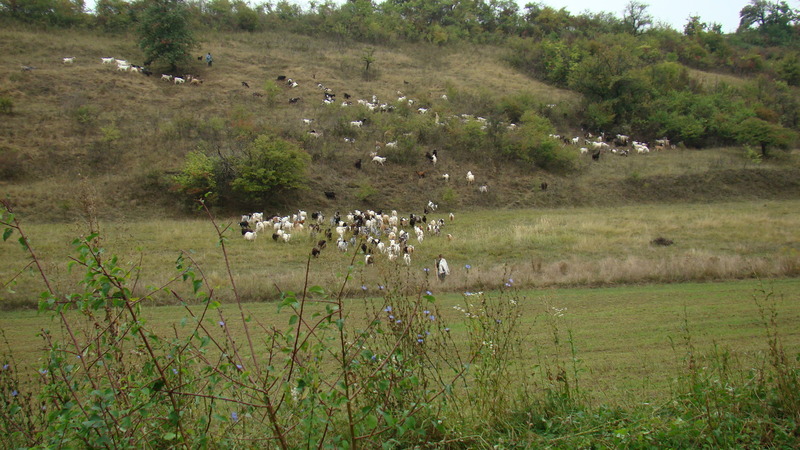 Goats spilling down the hillside watched by two goatherds. 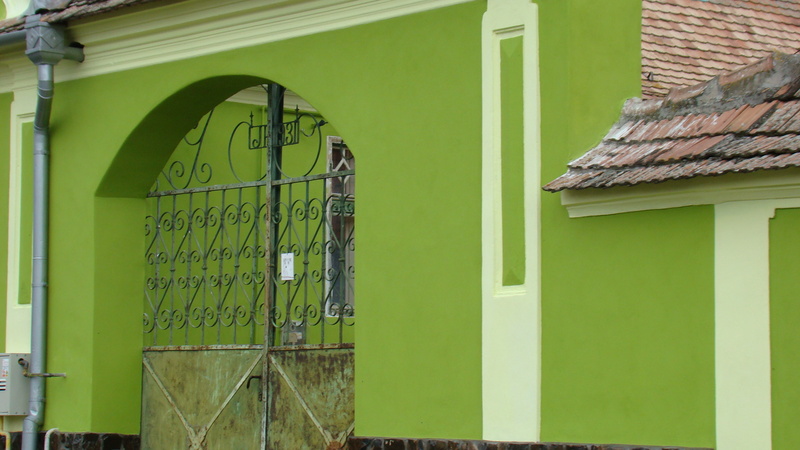 Example of a painted house in one of the villages. We had lunch in a town called Mediaș. I had a Romanian dish of mushroom stew with Polenta which was excellent if not particularly photogenic. One of the best things I had on the trip. 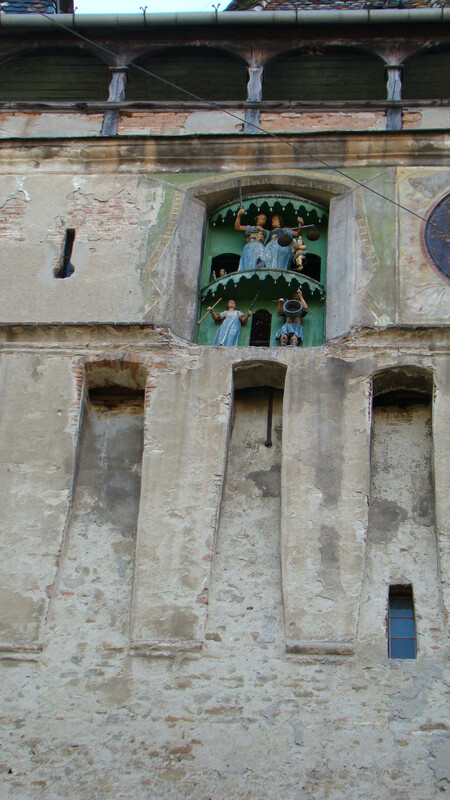 After lunch we went to Biertan and toured the massive church fortress there. They are restoring it so lots of work was going on. Church and fortifications from below. 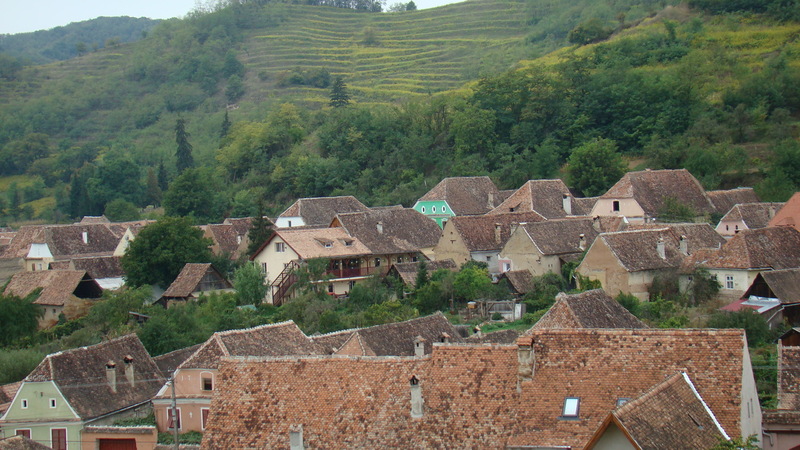 View from the walls of the surrounding village. 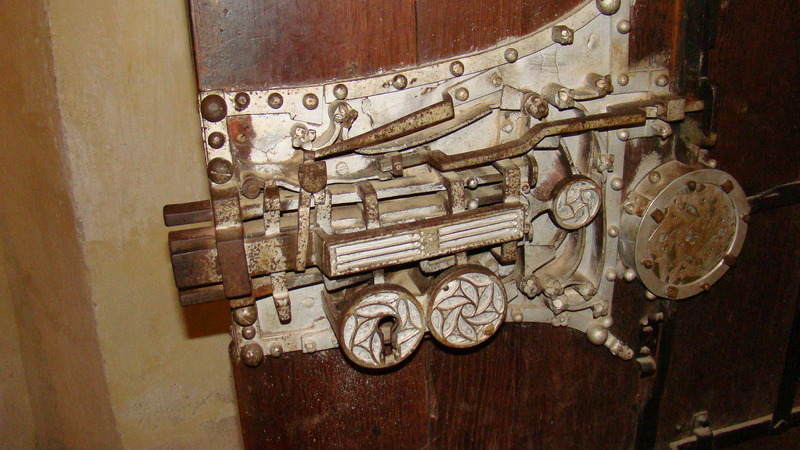 Amazing lock with 15 separate locks. 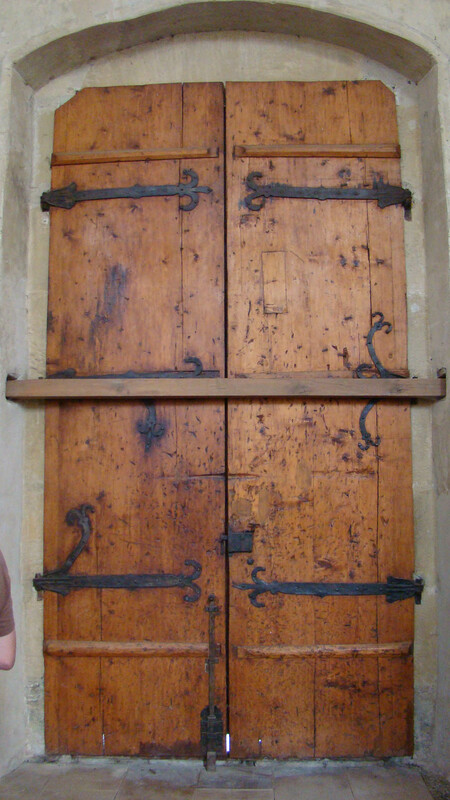 The door with all the bits that insert into the wall is below it. They really didn’t want someone to get in! We headed back for our final night in Sighișoara. 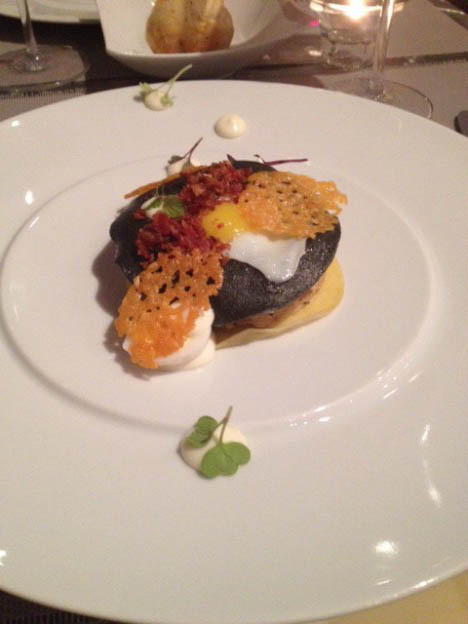 We ate at T. Josef Restaurant and Wine Bar. It was quite good. Next morning we were off back to Bucharest airport to stay overnight before our mid-day flight. The distances are very long. We broke up the trip stopping for lunch at a roadside motel with food. 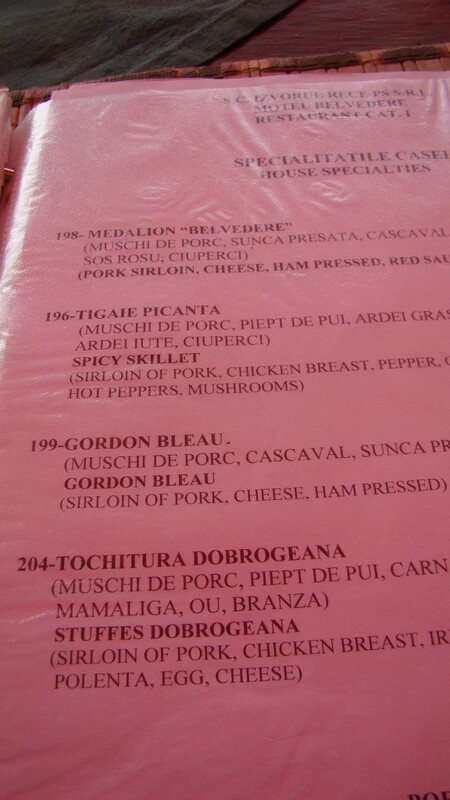 We had Chicken Gordon Bleau. Really! Here’s a picture of the menu. The trip was a success. Here we are…Wizzing home. 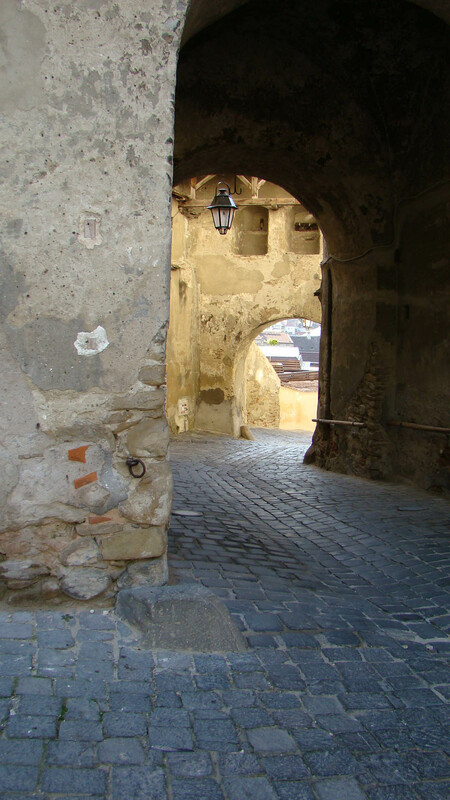 This entry was posted in Travel on September 27, 2015 by Nancy Hampton. 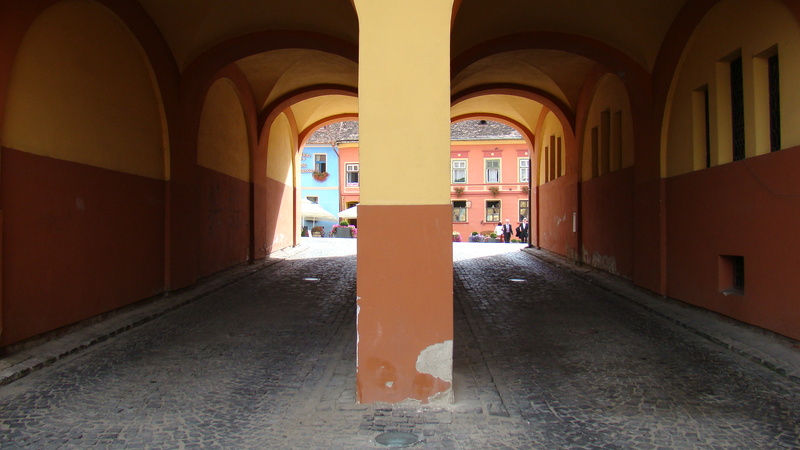 Sighişoara is a lovely town. Pronounced ziggyshwara. It is fairly large when you count all the outlying suburbs but the historic part is the Citadel. 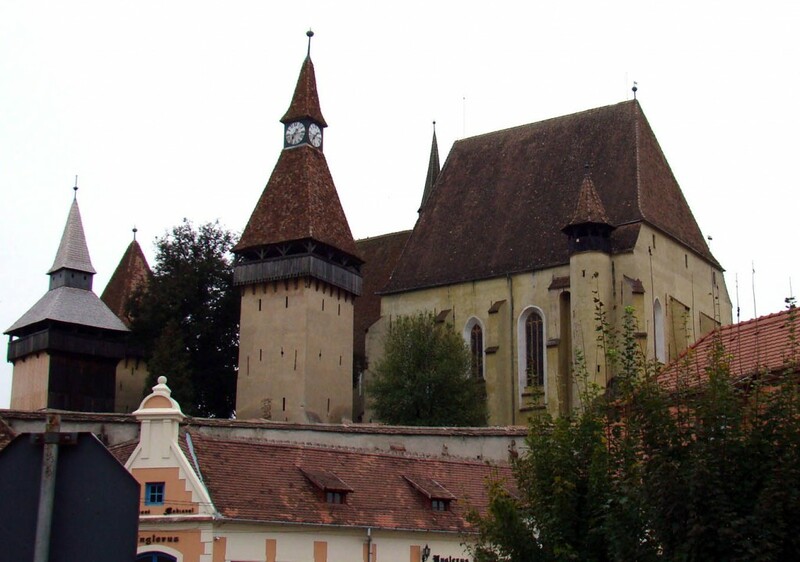 It started life as a Church on a Hill, which became a fortress. It floats above the modern, lower town. 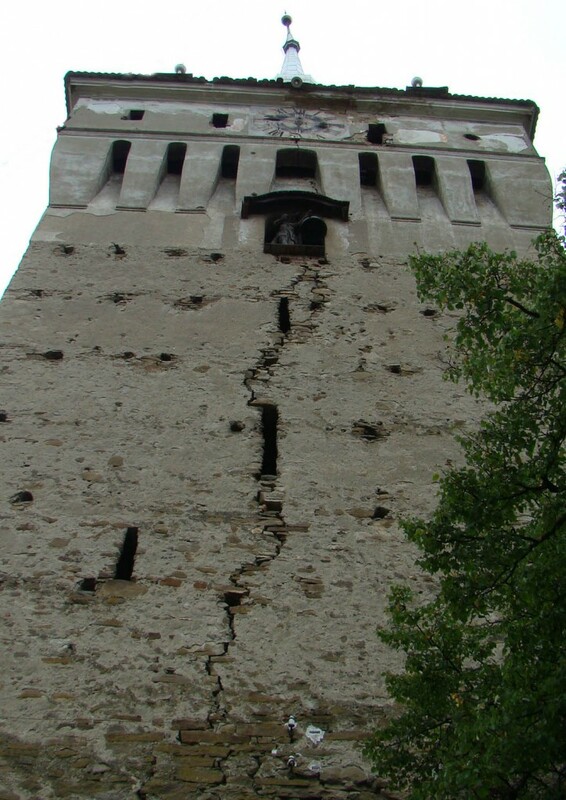 It was built after the Tartar invasion of 1241 which scared the bejesus out of everyone so they fortified. Now it has hotels, inns, restaurants and more souvenir shops than you’d ever need. One thing though, it is a living town, not just a tourist area, with school children laughing through the squares and small streets, church bells calling the faithful. 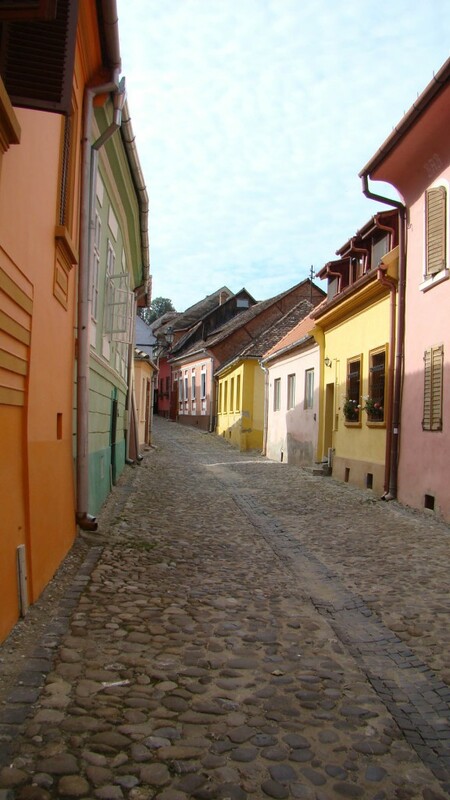 Streets and scenes of Sighişoara. We did the walking tour this morning. There are several gates and towers. Nearest our hotel is the Bootmakers Tower now housing the radio station. 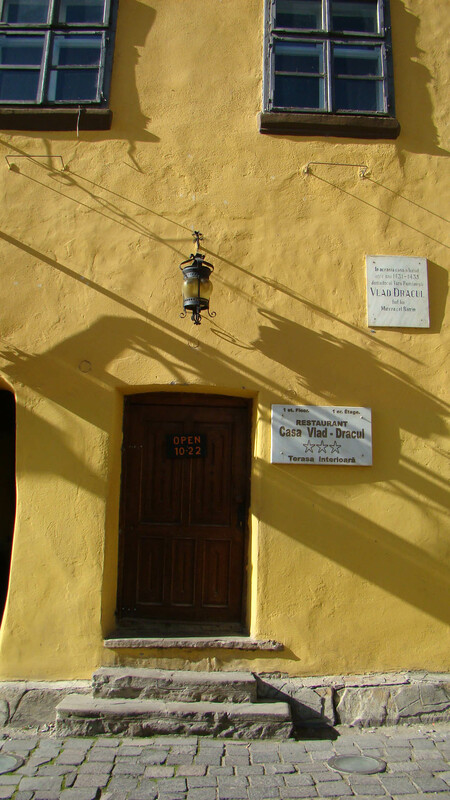 The main gate is the Clock Tower which is just next to the Monastery Church, now Protestant. There are also the furriers tower, the tailors tower, and the butchers tower. 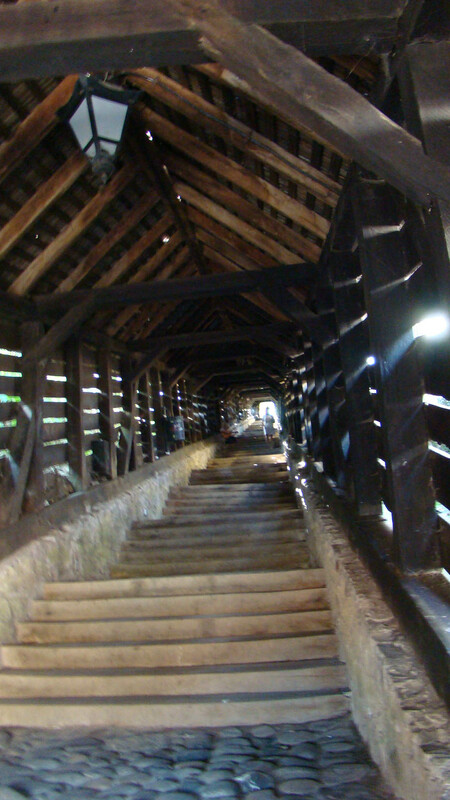 We hiked up the covered staircase, built in 1666 and has 175 wooden stairs. 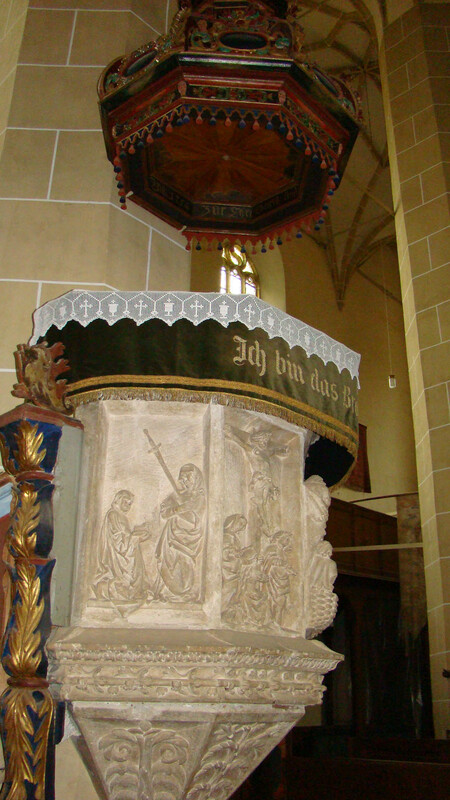 It carried the German school children to the school above. 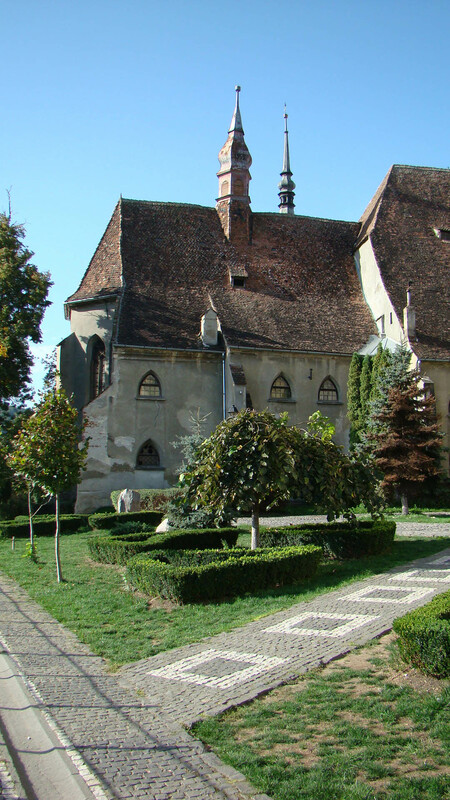 The school is just next to the Church on the Hill (Biserica din Deal), considered the most valuable historical monument in the town. 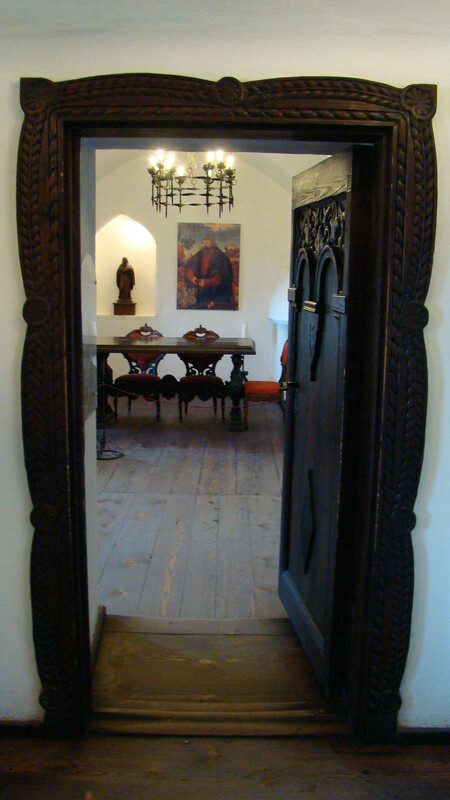 It was built in the 13th century but stands on the site of a much older chapel. Mechanical clock in main gate clock tower. 175 steps up a covered staircase brings you to the German School and the Church on the Hill. 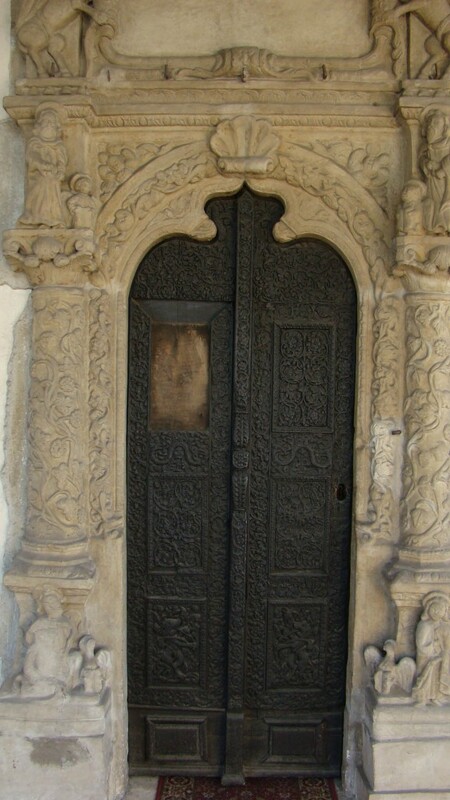 Door in the Church on the Hill. 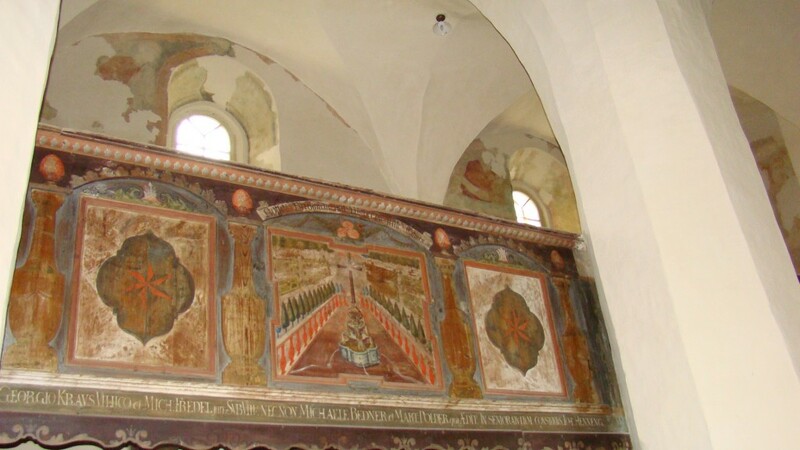 Murals dating from 1483 were destroyed by a fire in 1776. 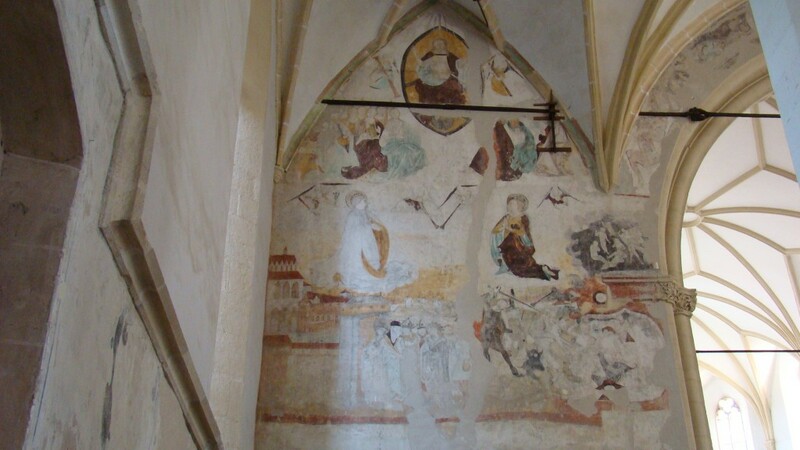 A recent restoration brought back fragments of the frescoes. 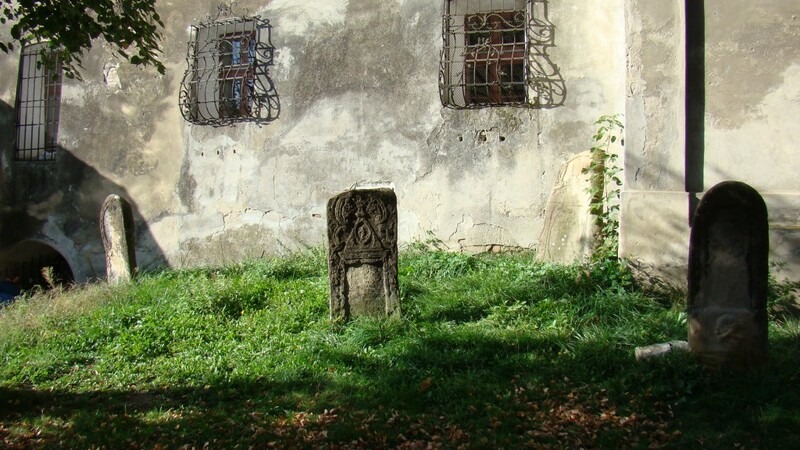 Tombstones in the cemetery behind the church. View from town up to the Church on the Hill. 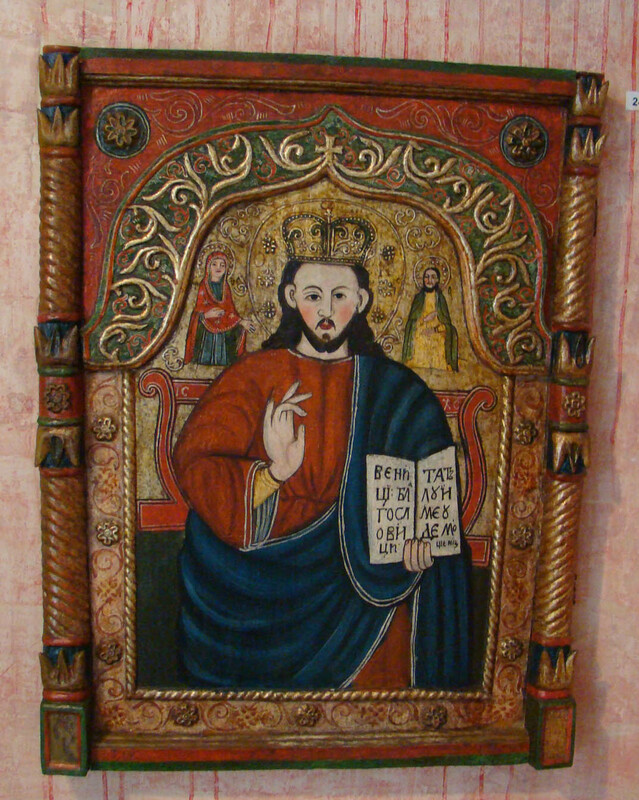 I would be remiss if I didn’t mention that Sighişoara is the birthplace of Prince Vlad Dracul aka Vlad the Impaler. He lived his first 4 years in this house, now a restaurant. 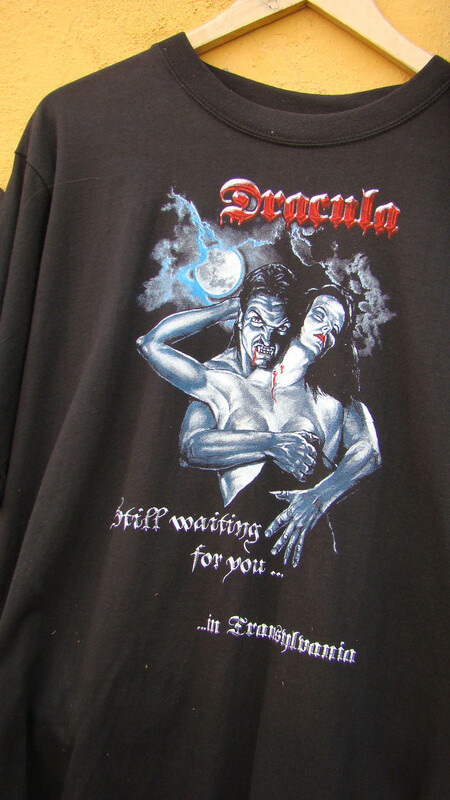 All the souvenir shops had T-shirts. We had lunch in T. Josef Restaurant and Winebar just down the hill in the lower city. It was a pretty, dark paneled room with a great old bar. 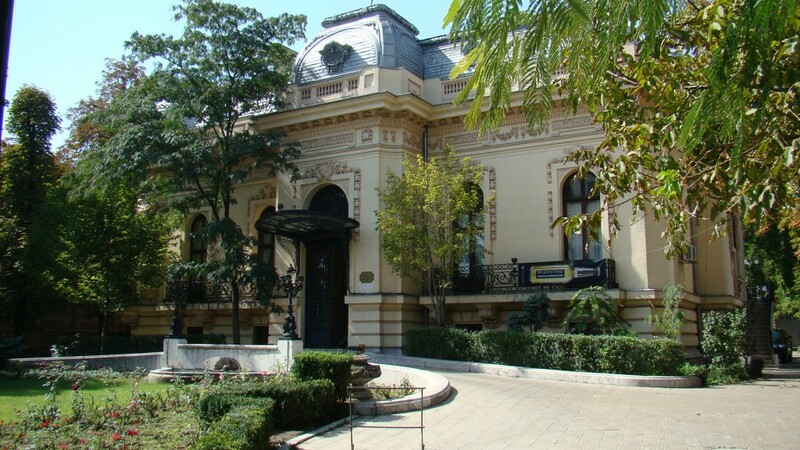 It was situated in the Park Central Hotel. It had good food and we decided to have dinner tomorrow evening there. 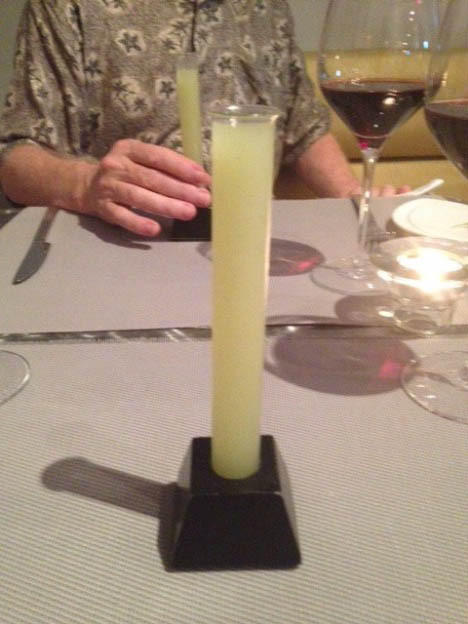 This entry was posted in Eating, restaurants, Travel, Trip Report on September 26, 2015 by Nancy Hampton. We took a taxi to the airport to pick up our rental. The trip to the airport was much faster than when we arrived. Maybe because it was Saturday. 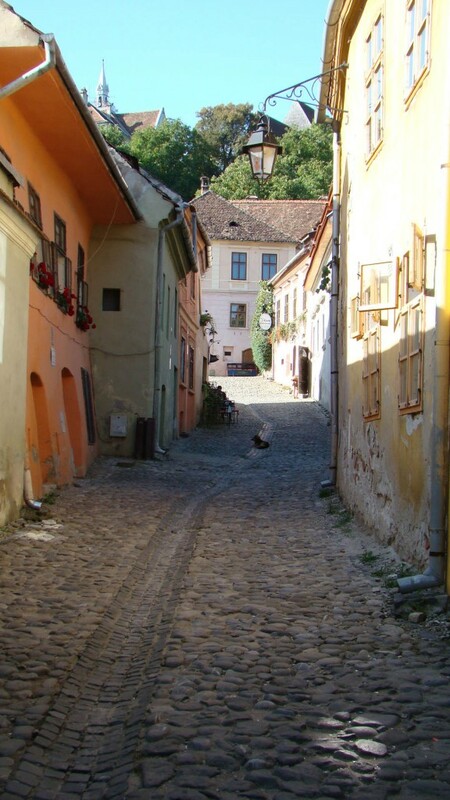 We set off north on the E60, the main route north which goes straight to our destination, Sighişoara. My thoughts of the trip. The road went through many small towns. They were essentially laid out along the main highway. No side streets. Almost every house was selling something. They changed wares as we went along. At first it was produce and flowers. Braided chains of purple eggplant, tomatoes, etc. Then it was all potatoes for a few kilometers. Huge bags of potatoes. One house sold brooms. Hundreds of brooms adorned the fences and yard. I can only assume they produced them themselves. One person had baskets and the large demi-john bottles wrapped in wicker. Farther along the road we came to a number of honey stands. The produce had stopped, the honey began. Along this very busy highway we encountered many horse drawn carts! I was surprised because we were not really out in the country there. First the landscape was very flat. Then we headed up into foot hills. Now we were seeing people selling something like large piles of orange and green things. Finally I realized it was lentils! The red ones and the green ones. Each stand had a pile. I may buy some on the way back. Sadly, we passed another example of the thoughtlessness of humans in some countries regarding their animals. When I see these things it makes me cry for hours. This poor dog was walking along the very busy highway. It’s left front leg was severely twisted, so severely that it looked like a bent up paper clip. It must have been broken in several places once. The dog was surprisingly able to walk on it so I assume it was an old injury, probably hit by a car, that had never been treated or set. I cannot help but think of the suffering this poor dog must have endured. He was skeletal and filthy and moving along with his head down. Just too sad to bear. I wished I could have taken him up and hugged him, fed him, cleaned him and made him happy. 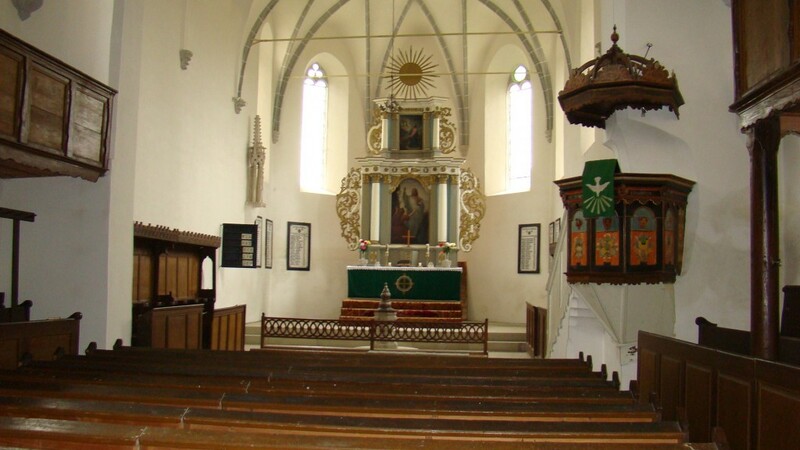 I even prayed in the Black Church (upcoming) that we visited that God, if there is one, would take care of his poor creature and either help him or put him out of his misery. It haunts me and will for a long time. We went through craggy peaks that were around 3,000 meters high. There were a lot of resort towns through the pass and along the river. 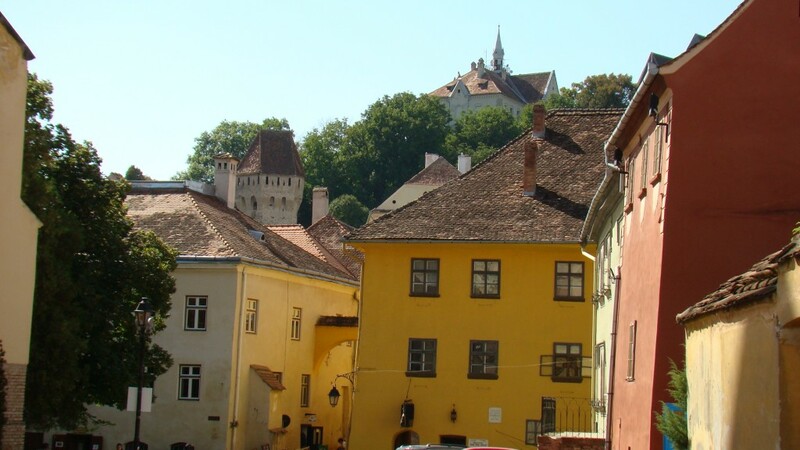 We had decided to stop in Brașov to break up the drive, see the sights and have lunch. 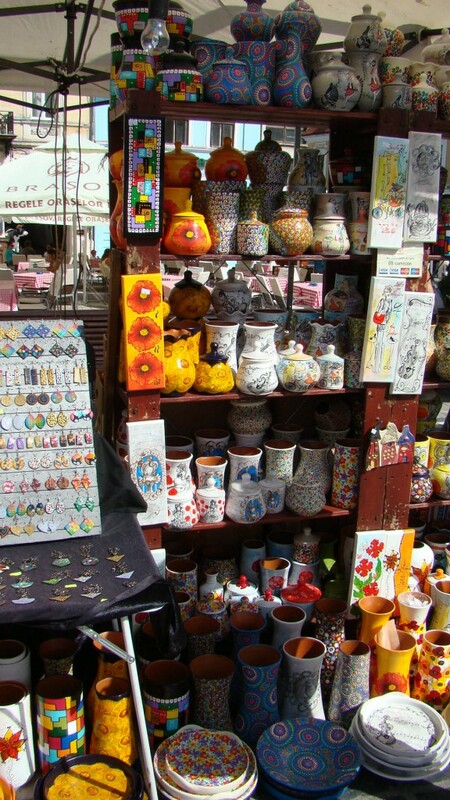 They had a nice market going there with lots of unusual wares. We visited the Black Church, so called because it had been blackened by fire. It had a pipe organ with 3,200 pipes! We had an nonnotable lunch. The weather was very hot! 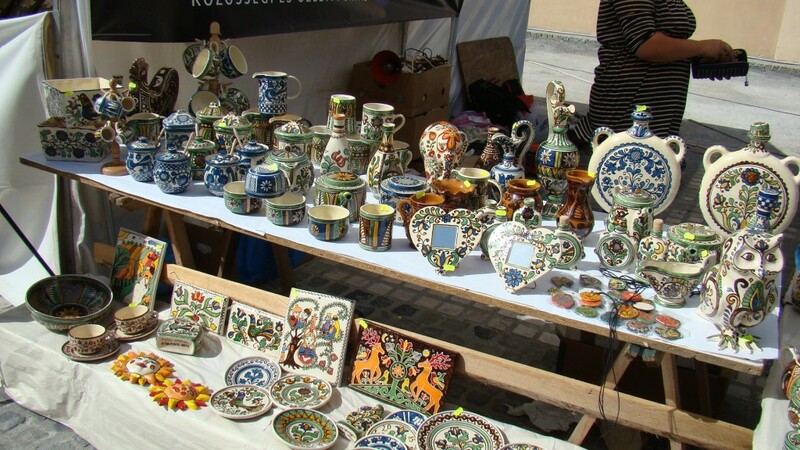 Market day with really unusual wares. 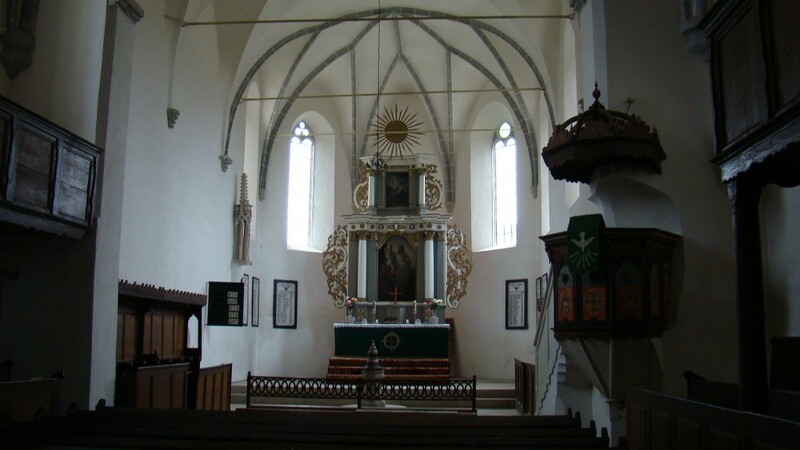 This was the black church. So named because a fire blackened it’s interior. 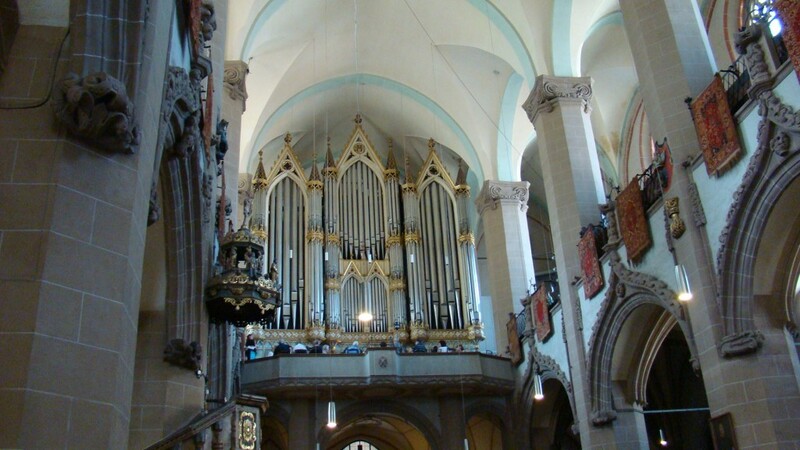 It also has Europe’s largest pipe organ with 3,200 pipes. 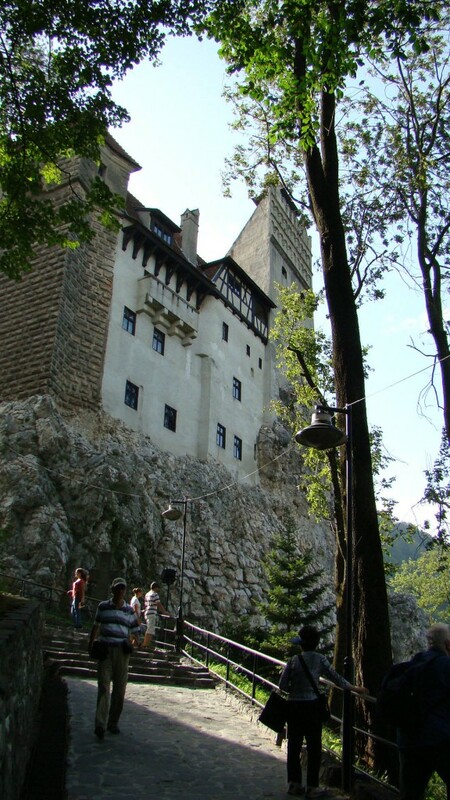 We decided, because we were close, to visit Bran, home of Dracula’s castle. It was a complete zoo but we managed to follow the crowd into the castle for a look see. 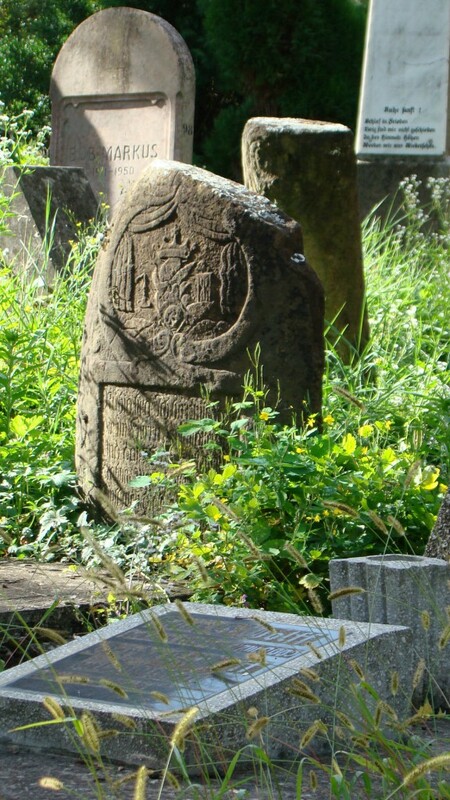 It had been inhabited most of its existence so was in good shape. 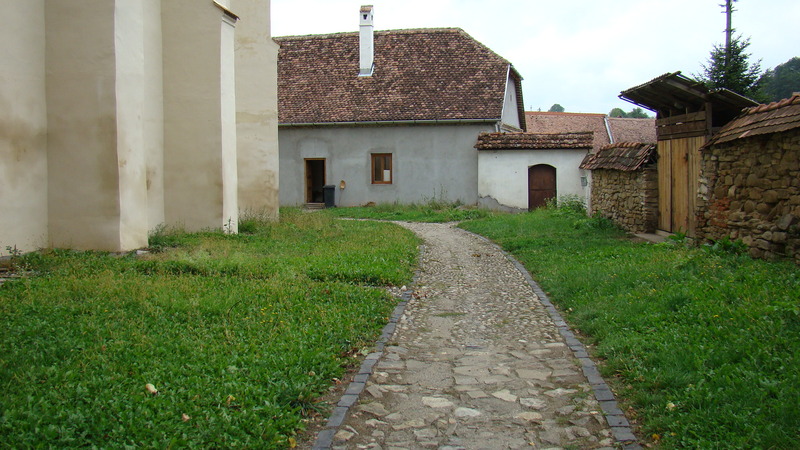 Now we needed to make tracks to Sighişoara because we were still 2 hours away. The drive from Brașov there was very beautiful. It went through a park and some very bucolic countryside. We encountered many more horse drawn carts hauling, logs, people, hay. They pile their hay into haystacks which are supported by a central pole. This is done manually. 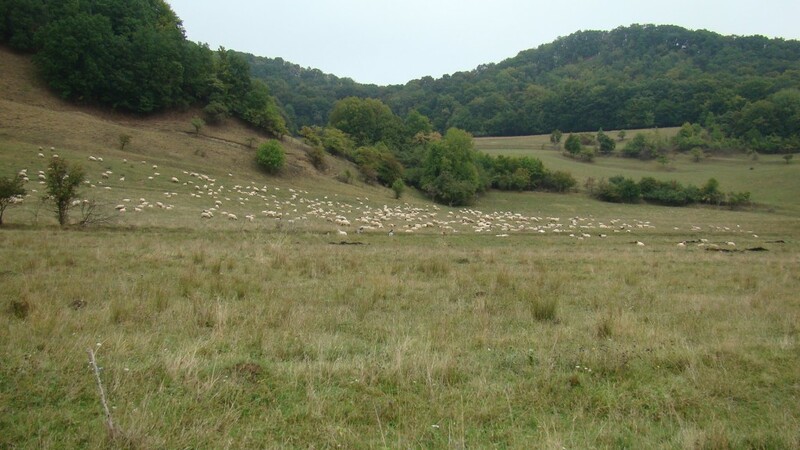 We also passed numerous flocks of sheep, goats and cattle each accompanied by a shepherd, goatherd or cowherd. I read the flocks are owned jointly by the villages. 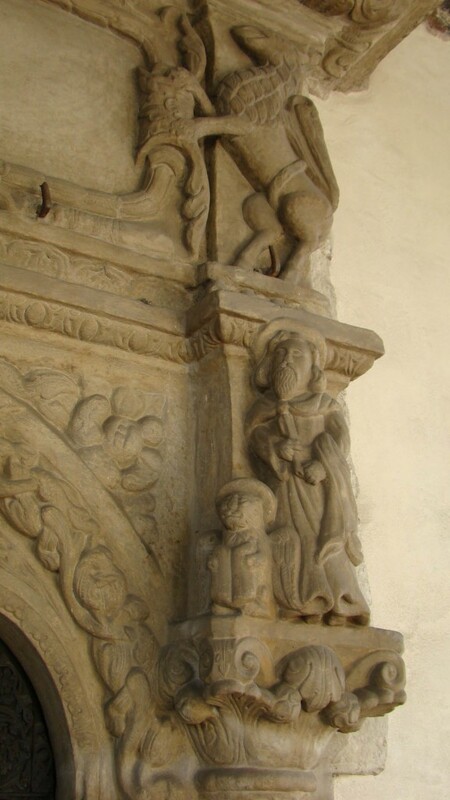 I assume the shepherds come from the village but the book said they are a dieing profession. I have to wonder how the flocks will be attended without a shepherd. I saw not one fence anywhere. 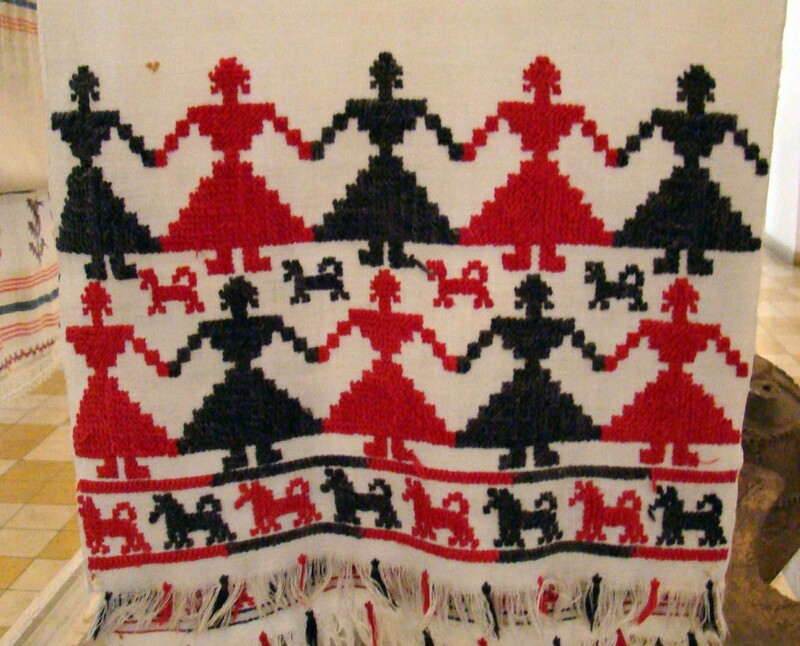 I also had to wonder how all the land, houses, livestock was divided up after the fall of Ceausescu in 1989. Boggles the mind. 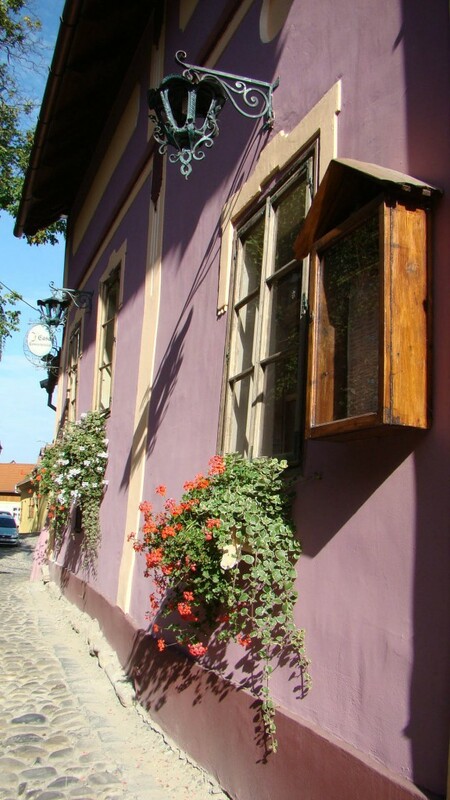 We arrived in Sighişoara and found our hotel, Casa Georgius Klauss. Nice place with a restaurant and bar inside the walls of the city. We decided it was time for a beer so we relaxed a bit in the bar then went to clean up for dinner. We ate at the hotel. The food was OK. Not great. We split an order of calamari with tzaziki sauce. 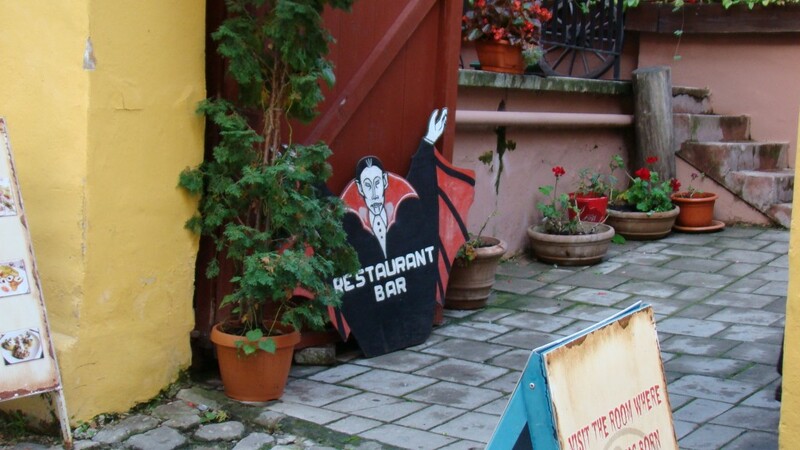 Then I had the filet steak on spinach and luther had the Transylvanian speciality chicken. The chicken was very good. Off to our rather difficult room. It is a big room, for sure. There is a big bed on one side and across from it a bath with toilet and sinks. The oddity is a big soaking tub right in the room with the bed. Also no dresser. There is a three step up closet affair with a wardrobe crammed in. You have to duck to get in, the door being only about four feet tall. Then there are very few hangers and you have to put your clothes on the floor. I like the hotel but it would be an easy fix to add a small chest of drawers in the wardrobe. 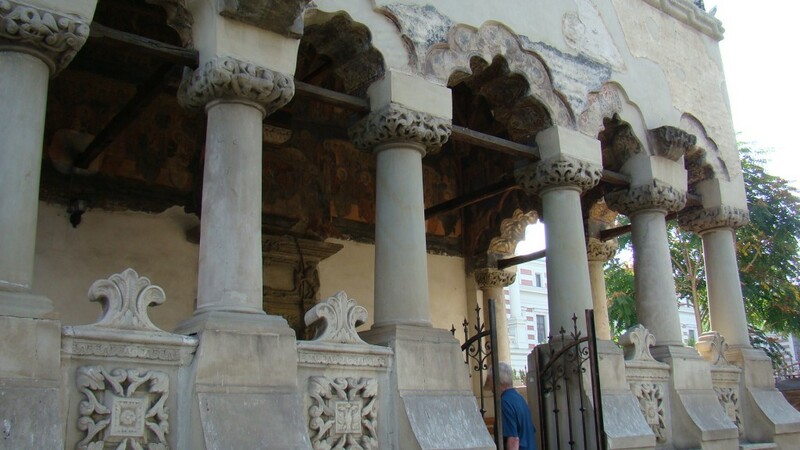 This entry was posted in Travel, Trip Report on September 25, 2015 by Nancy Hampton. 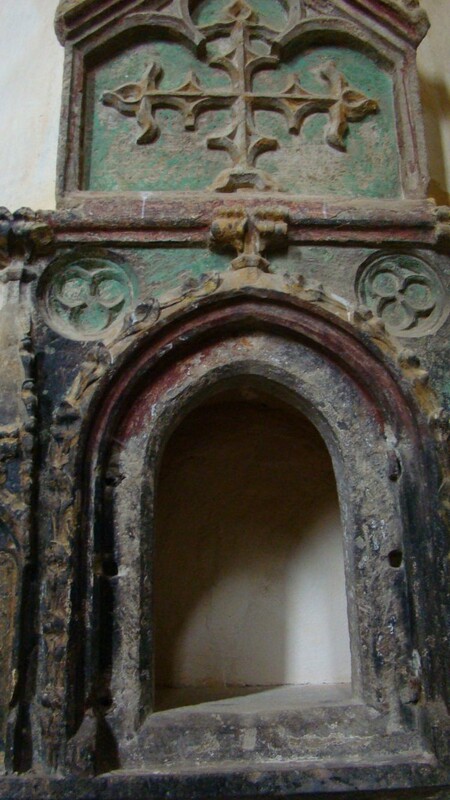 Example of the painted alter pieces. They had four themes and were nearly all the same. The same open book, same way they held their right hand. 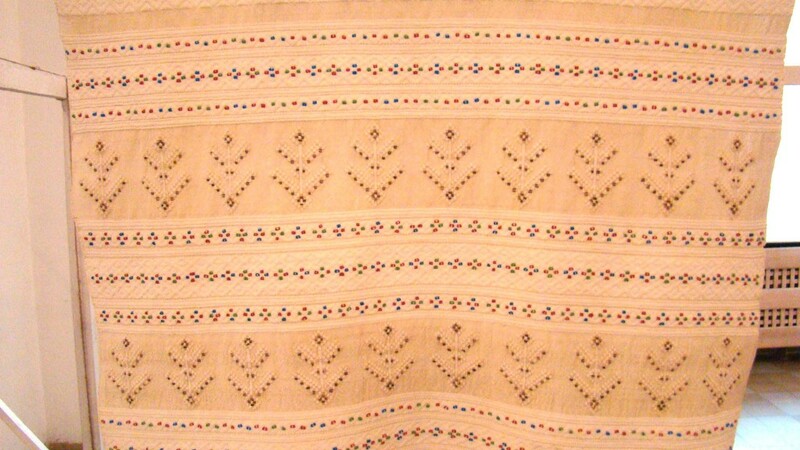 Examples of the beautiful needlework. 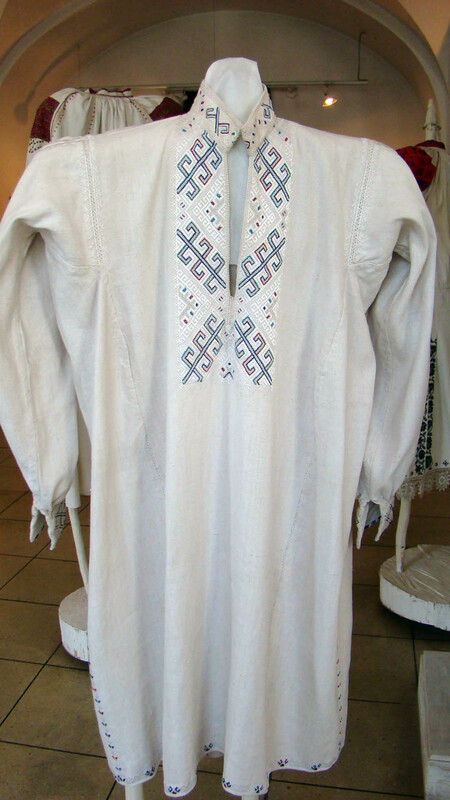 It was on slightly rough but still soft linen. Then we visited the Geological Museum. Lotsa rocks, which are interesting to a point. Some other interesting evolutionary stuff. We did not stay too long. It was lunch time. We took the Metro back. They have a nice one but it is not finished. Lucky for us were are near the University stop and the museums, in the Garden District are just two stops away. We decided to try an outside place near our hotel. It had decent sandwiches and world class French fries. It had a shady patio so it was OK.
For dinner we went back to the Bistro GUXT. It was again good. 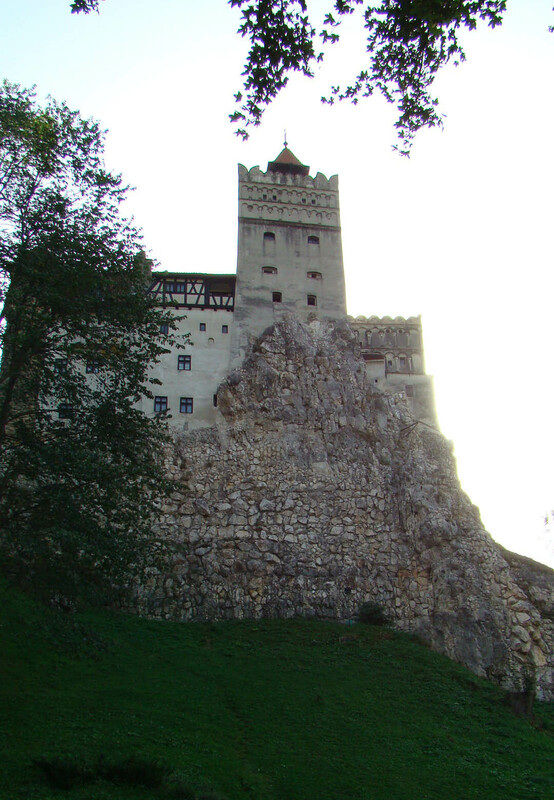 Tomorrow we are off to Transylvania. 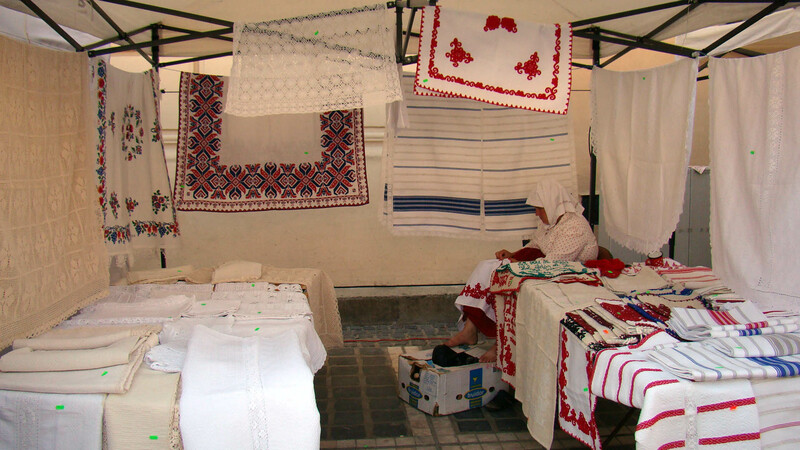 This entry was posted in Travel, Trip Report, Uncategorized on September 24, 2015 by Nancy Hampton. This is going to be a trip report so if reading stuff like this is not your thing you can stop reading now. Also, I will be posting these after we returned. I tried to write them as we traveled but had to wait to return to have access to my pictures. 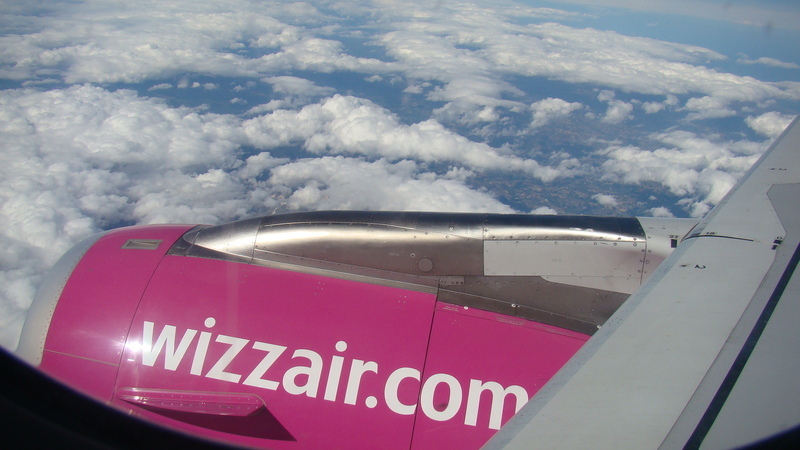 We flew from Perugia airport on Wizz Air. Despite the name the flight was on-time and fine. The odd habit of people in parts of Europe to applaud when the plane lands was performed enthusiastically. We took a cab and it was rush hour. Wow what traffic. We are glad we are not driving. Our cab driver spoke Romanian and French. This turned out to be the norm. Who knew the second language in southern and eastern Romania was French?! The time is an hour later than in Italy so we got to our hotel after seven. We are staying in the K+K Hotel Elisabeta. We had booked a restaurant called The Artist for 8:30. It was too rushed for me. We walked on the advice of our hotel. We got a little lost and finally arrived about ten minutes late. But we were glad we went. The food was really good. The service, less so. It is a small restaurant with about 13 tables. 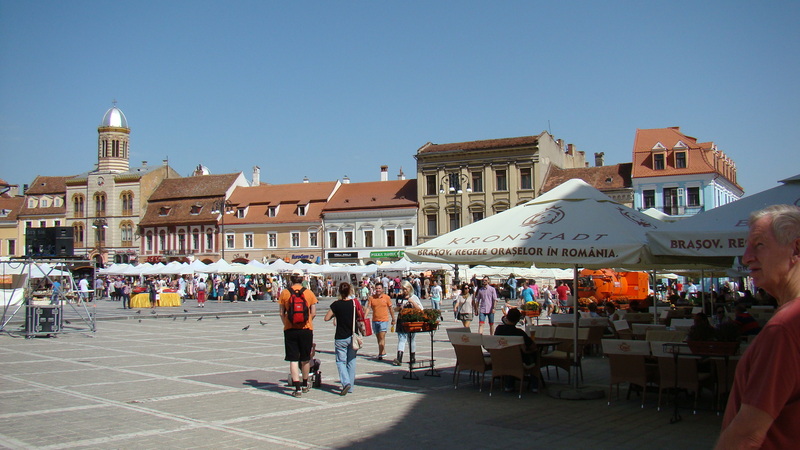 It is in the old town which is chock-a-block with eateries and drinking venues. 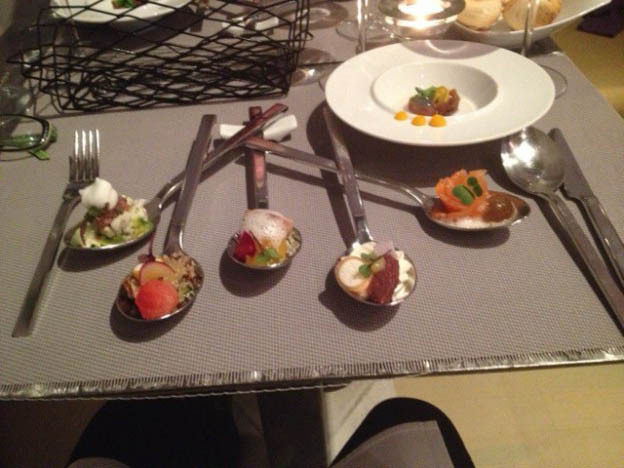 They have an interesting idea to let you try a bite of each course if you want. It’s called Spoonfuls. We tried that with the appetizer. It was great! 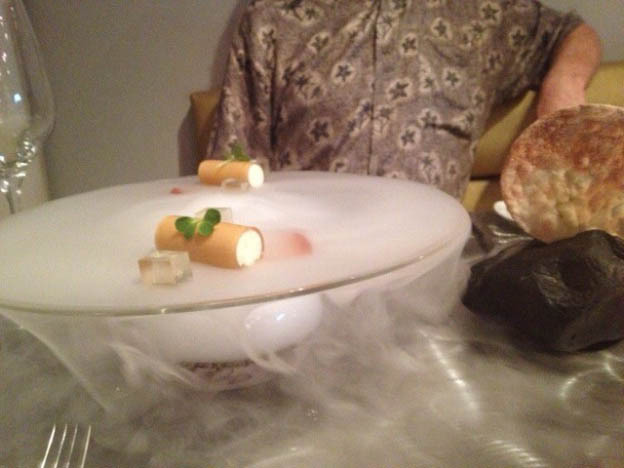 There were also some “gifts” from the chef, one of which they poured a liquid into the dish and it steamed like dry ice. Pretty nifty. Another was a tall glass of gingery palette cleansing liquid. My entree was pork “ravioli”, really one big sandwich. A nice dinner. Our first day we had a most excellent breakfast and headed off for a walking tour. 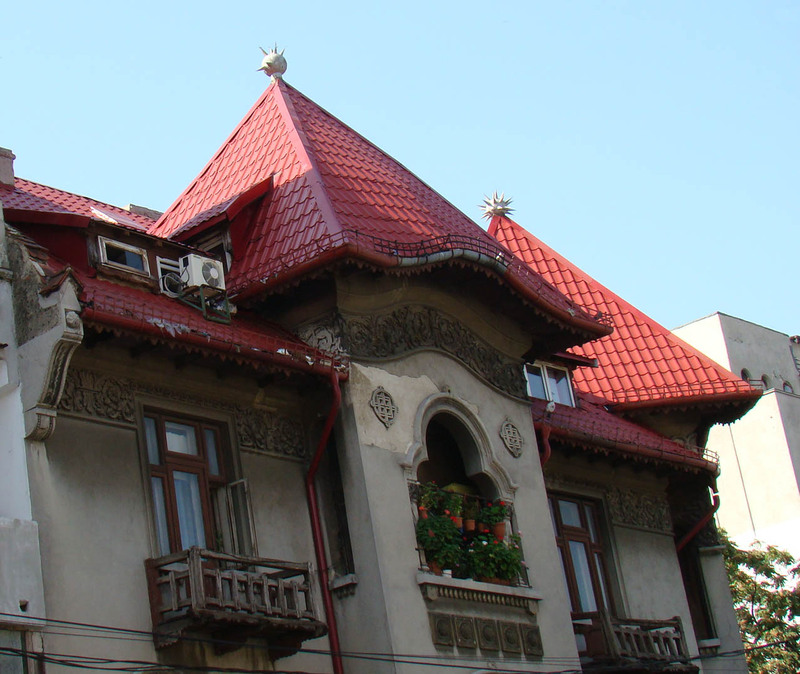 Bucharest, having been the most repressive communist country, is a city in transition 26 years after the fall. 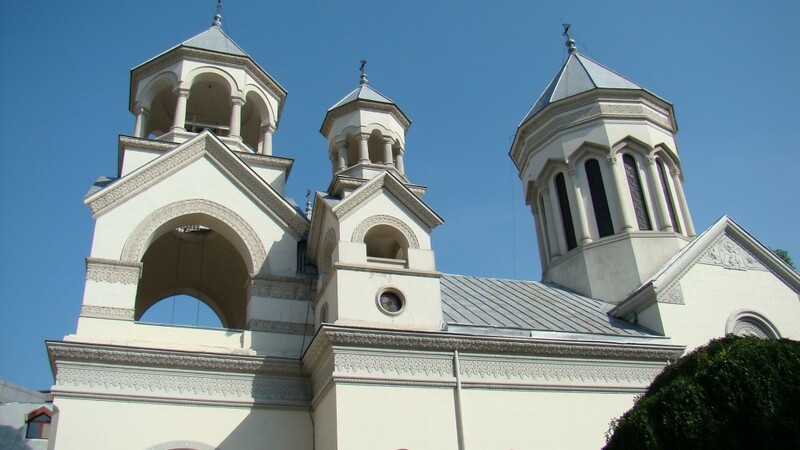 It has gorgeous Orthodox churches, modern buildings next to decrepit crumbling ones. 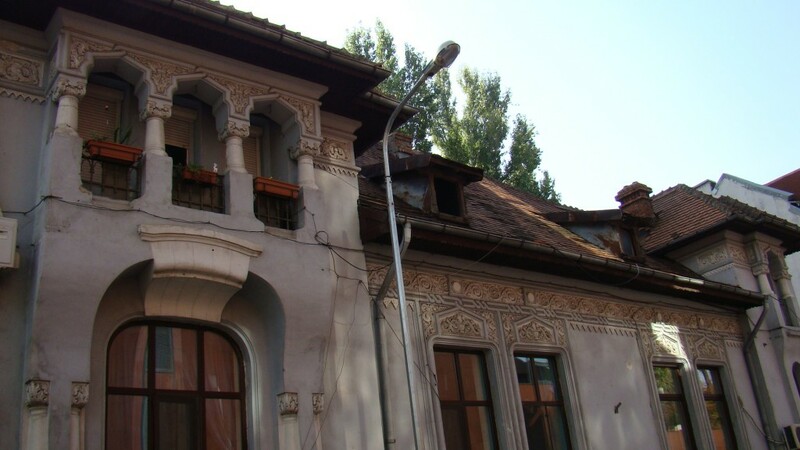 There are horrible communist buildings that are very ugly but there are also many old houses that survived communism which are beautiful if in need of a lot of TLC. 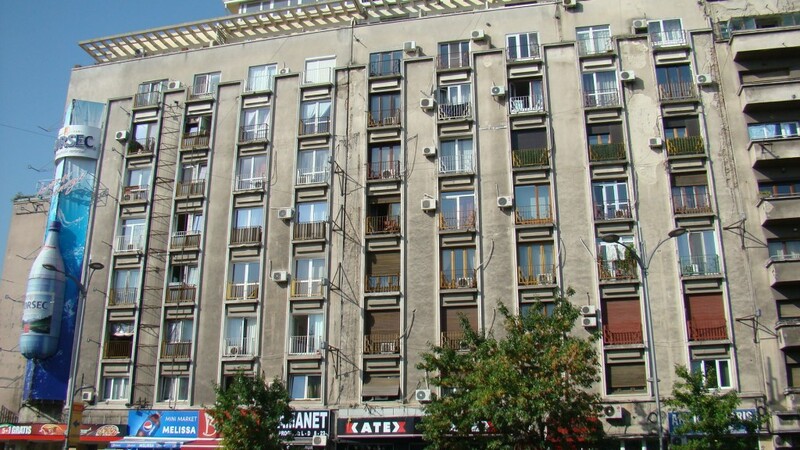 Ceaușescu tried his best to raze the city but a lot managed to remain. I think it will become gentrified eventually. 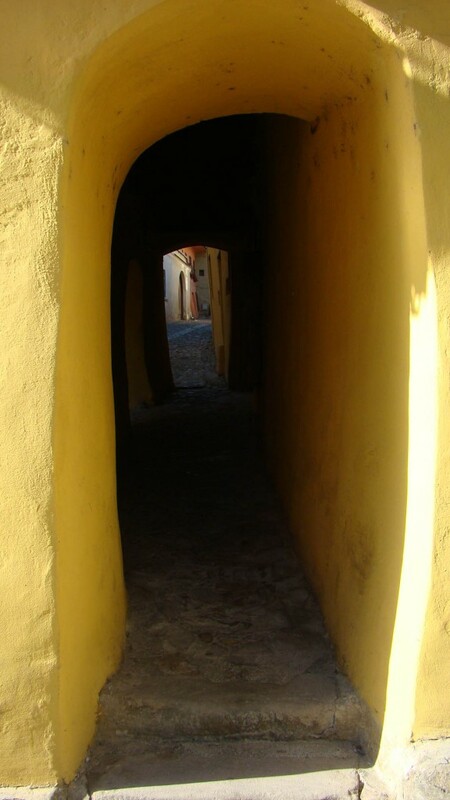 After our long walk we headed back to the old town where we had lunch in a touristy place. I had a basic caprese salad. Back to the hotel to kick back for a while before dinner at Bistro GUXT. It turned out to be nice. The owner was very enthusiastic about wine, food and beer. I liked that it had a few Asian inspired dishes. So, I had a nice half portion salad with Gorgonzola and pears, and for an entree I had spicy prawns in coconut milk with rice. Lovely after such a long time without anything like it. So that ended our first day. Here are some selected pictures. I hope it gives sort of an overview of the differences throughout the city. 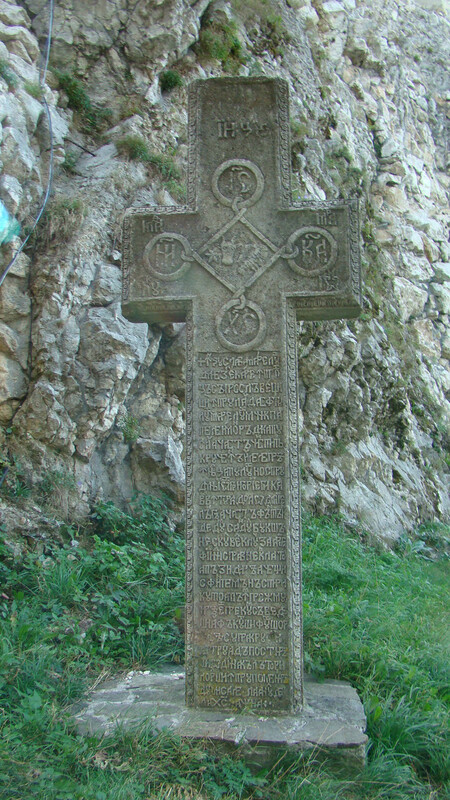 The first four are of the oldest Eastern Orthodox church. Such beautiful detail. 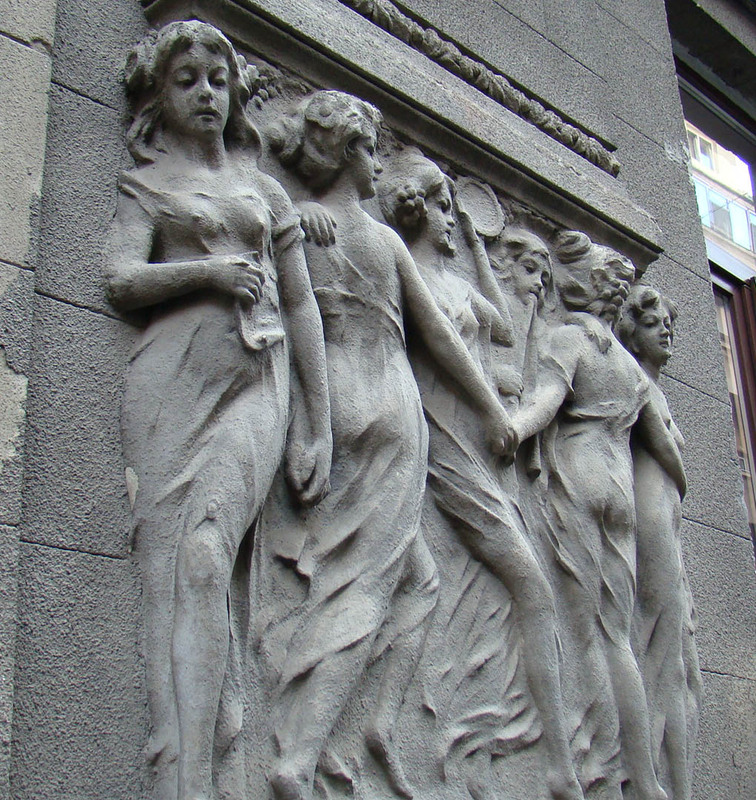 This was just a random frieze on a building which I thought beautiful. 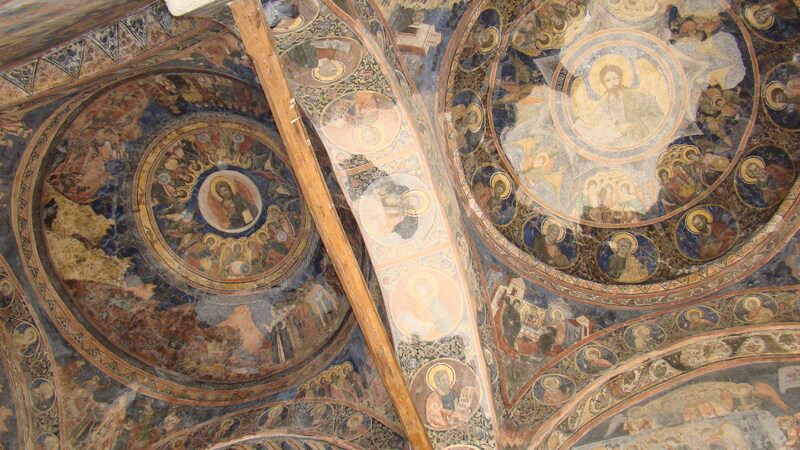 This was the Armenian cathedral. 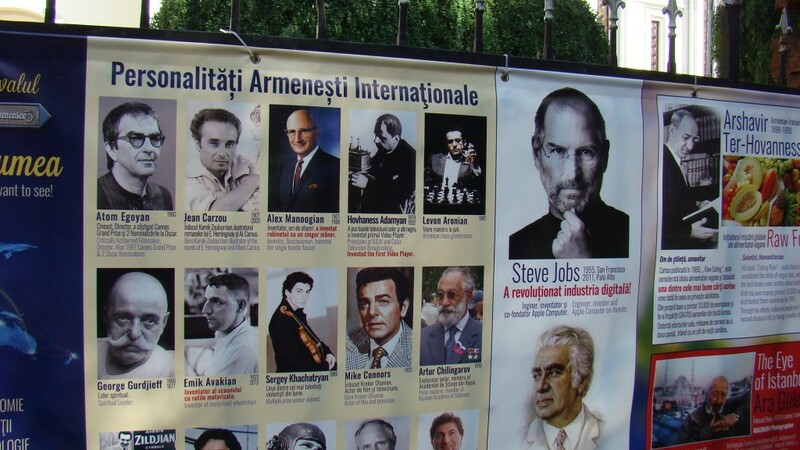 Turns out their were many famous Armenians that immigrated to Romania and beyond. Cher and Steve Jobs are just two. They had a memorial to them. The good the bad and the ugly. First the ugly. 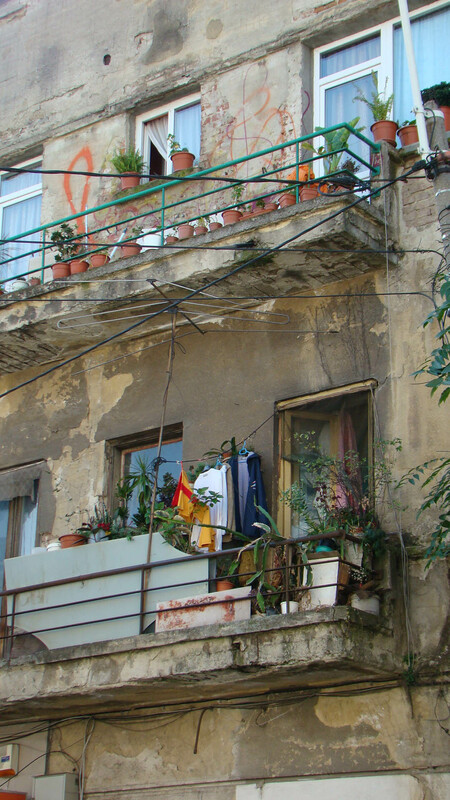 Note the added air conditioners. There was a good bit of Dada inspired architecture. This one needs major help but note the facade. Could be beautiful. Needs TLC as many buildings do. 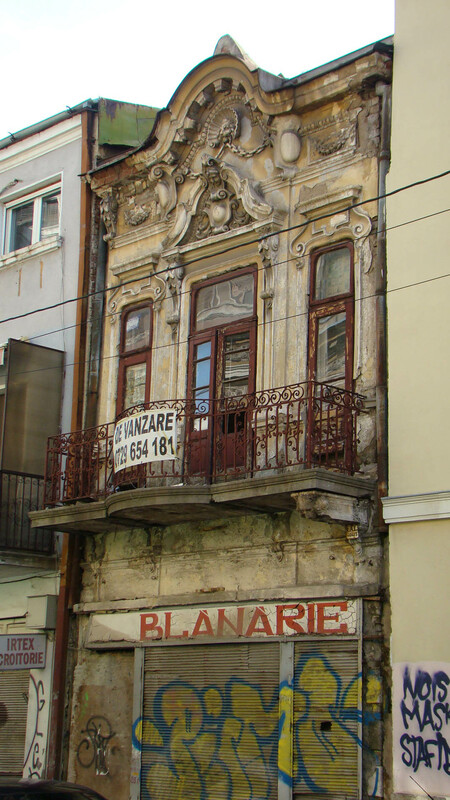 Beautiful French influence in many of the buildings. And the bad old days of Communism. 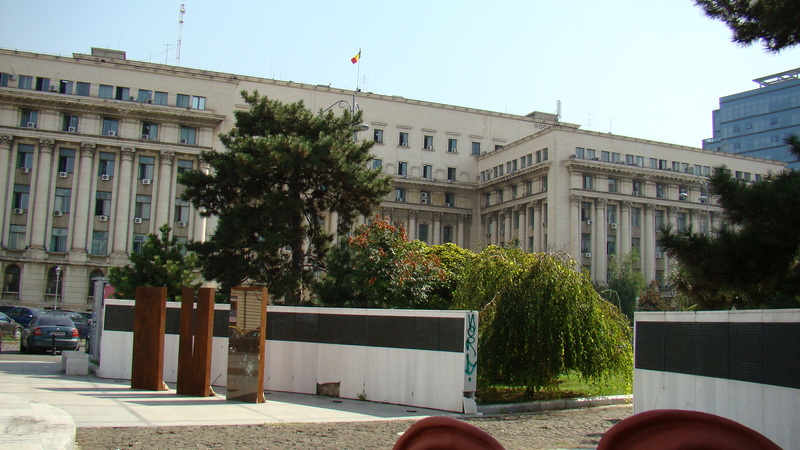 This is Ceaușescu‘s Palace. 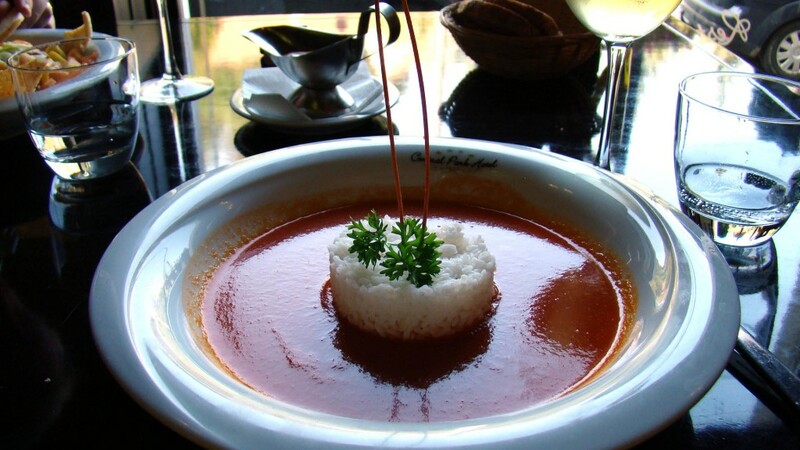 This entry was posted in Eating, restaurants, Travel, Trip Report, Uncategorized on September 24, 2015 by Nancy Hampton. Montepulciano was an interesting location, but it’s time to get back to Umbria. 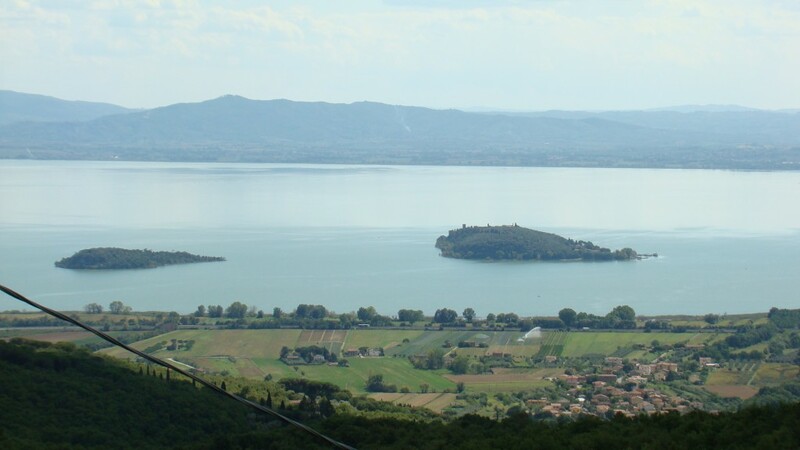 Today, we’re going to visit the Romanelli vineyards, which lies 1000 feet up on the Colle San Clemente, one of the northern slopes leading to Montefalco with a lovely view of Assisi and its surrounding hill towns in the distance. Monte Subasio rising up behind Assisi. The cantina sits just above the vineyards abutting Montefalco in what appears on approach to be a neighborhood, but quickly turns into rolling fields of grapes and olive trees an you descend from the road into the property itself. For anyone wishing to follow our footsteps, I would recommend an excellent GPS–which we did not have–or good eyesight and luck. The signs to the vineyard are very small and seemingly placed at random. 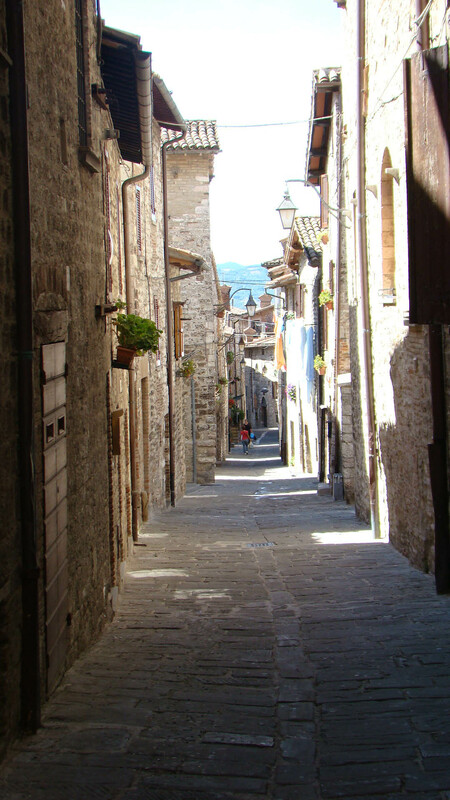 We required a quick trip into Montefalco for directions; fortunately the property is well known and we had no problems after that. At the Romanelli cantina we were greeted by Devis(! 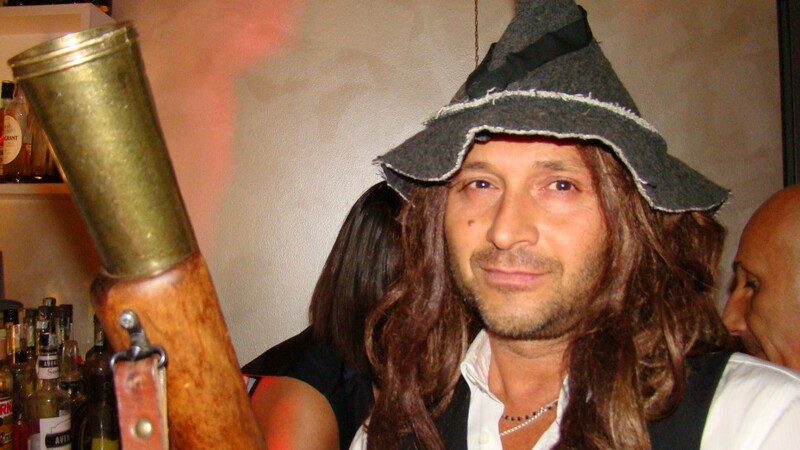 ), the Romanelli family member in charge of all matters related to wine. As you might imagine, we were rather struck by the name. It turns out that it was somewhat a fad in Montefalco some thirty years or so ago, and there are, in fact, three other men named Devis in Montefalco. Not bad for a town with 5,800 inhabitants! Having straightened out the matter of his name, Devis proceeded to give us an overview of the family and its property. The Romanellis have owned the property in Montefalco since 1978, when Davis’s father and grandfather purchased it and split it into olive trees (34 acres) and vines (16 acres). The vineyards themselves are somewhat sheltered from the prevailing winds by the hills themselves and are in a clay soil rich in lime. 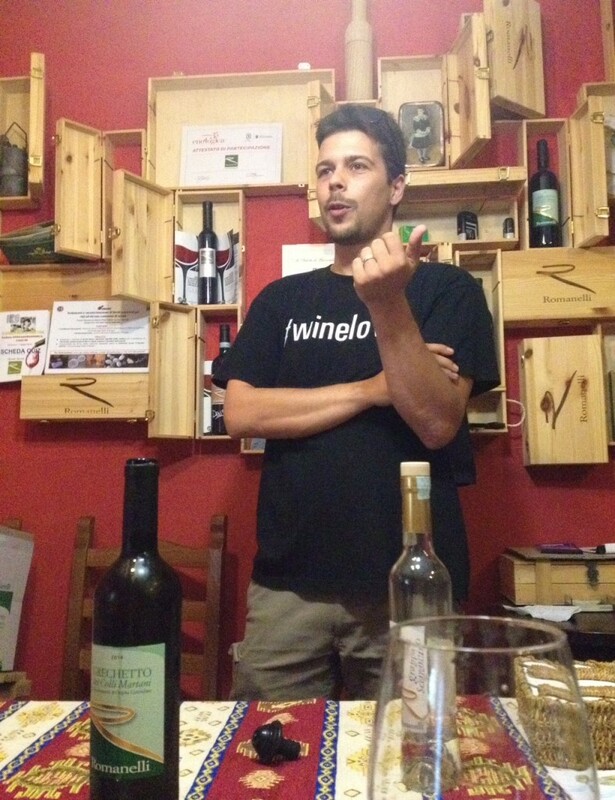 Today, the property is managed between Devis and Fabio, who handles the olive oil side of the business. Devis is quite the jack of all trades, handling the management of the vineyards, the winemaking tasks and sales. 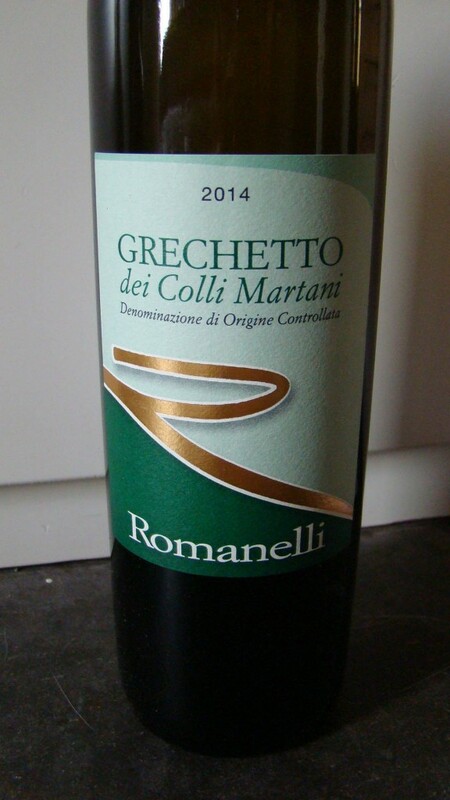 We started our tasting with a Grechetto 2014. It was striking, exhibiting considerably more body and varietal character than we expected from the workhorse of the Umbrian whites. Its characteristic minerality was well balanced by a lightly floral bouquet and a touch of fruitiness that I found unusual. 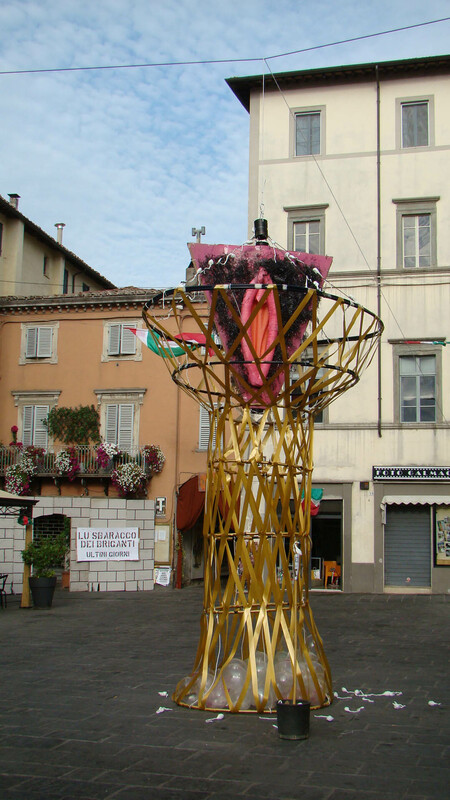 Given that 2014 was an unusually cool, wet year in Umbria, I was very interested in discussing the wine with Devis. He told me that the sheltered location of the vineyards protected them from the unusually wet weather last year and enabled him to harvest in late September, two to three weeks later than most vineyards bring in grechetto. In addition, the wine underwnt a long, slow fermentation at 15 degrees Centigrade followed by six months in stainless steel tanks. The wine undergoes a further two months of repose after bottling to bring out the maximum from the Grechetto. A hit, this one. Now it was time for the reds (Romanelli, like most producers around Montefalco, is largely dedicated to red wines). Devis first produced a Montefalco Rosso Riserva 2010. This Rosso, as with any DOCG Montefalco Rosso, is mostly Sangiovese (65%) and Sagrantino (15%), but also includes contributions of Merlot (10%) and Cabernet Sauvignon (10%). As with all his wines, the grapes in this one were harvested relatively late (mid to late October), given 45 days of maceration on the skins and plenty of barrel aging in both small (225 liter) and large (2500 liter) French oak barrels. This produces a monster Montefalco Rosso, by far the biggest I’ve ever tried. The fruitiness of the Sangiovese and the Merlot is exquisitely balanced by the somewhat more austere and tannic Cabernet and Sagrantino. It was very full in the mouth, with cherry notes, with a long, very smooth finish. Devis told me that because he prefers to extensively age his Montefalco Rossos, he produces only a Riserva. Instead of producing a regular Montefalco Rosso, which would require less aging, he prefers to produce a non-oaked wine for everyday drinking, called Predara, Sangiovese (80%) with Sagrantino (12%) and Merlot (8%). It sounds intriguing, but it was all gone. Something for later. This being Montefalco, the 2010 Sagrantino was rolled out with considerable ceremony including changing the glasses, pouring a small bit of wine in each glass and spinning it in order to coat the inside and a bit of inhaling and sighing (It’s great to see the winemakers doing what they like). 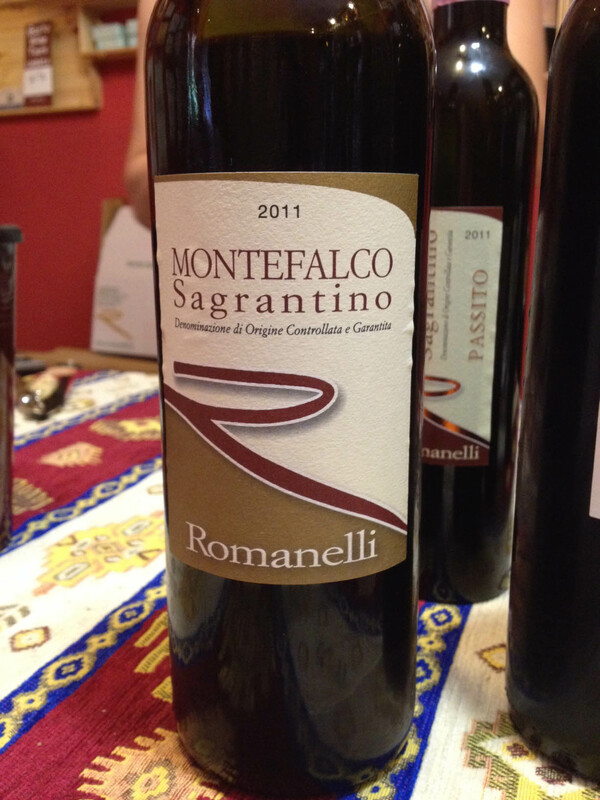 The Sagrantino used in this wine is hand-selected from the entire crop, the rest going to the Montefalco Rosso (also hand-selected) and the Predara. As with his other wines, this one received extensive maceration (45-60 days) on the skins to extract the maximum character to the wine, and then spent 18 months in a variety of large and small French oak barrels. After this aging process, the wine spent 10 months in the bottle before being released to the public. This, too, was a blockbuster. Tremendously perfumed, with an earthy, tobacco-like character underneath. The tannins have been tamed and the wine is possessed of a full body and roundness with fruity notes. The finish here was also excellent. I’m sure it could go longer in the bottle, but it’s drinking fabulously now. We followed the Sagrantino up with its passito version. As you probably remember, passito is the traditional style of winemaking in Montefalco, where the grapes are laid out in a sheltered area and allowed to dry for several months, the wine being produced normally around Easter time after a short stay in oak barrels. The wine is usually made very dry, as was this one, and I can only compare it to a vintage–not a ruby or a tawny–port. It has a strong character of the grape, but almost no sweetness. 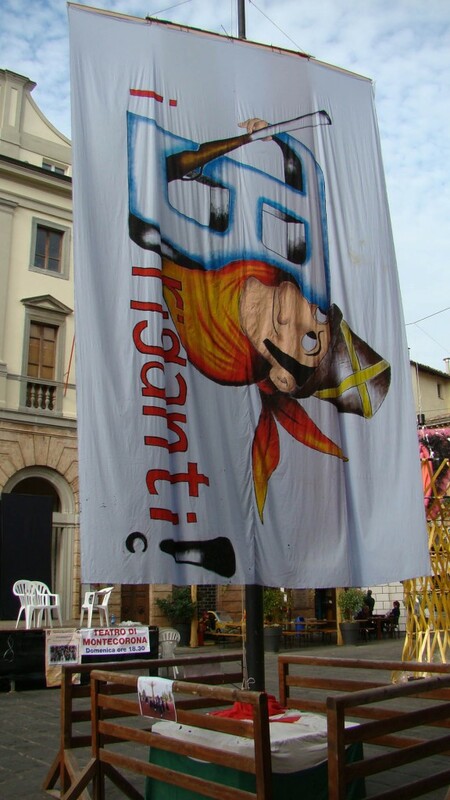 I find it a bit too subtle, but the Umbrians love it and almost every producer makes one. 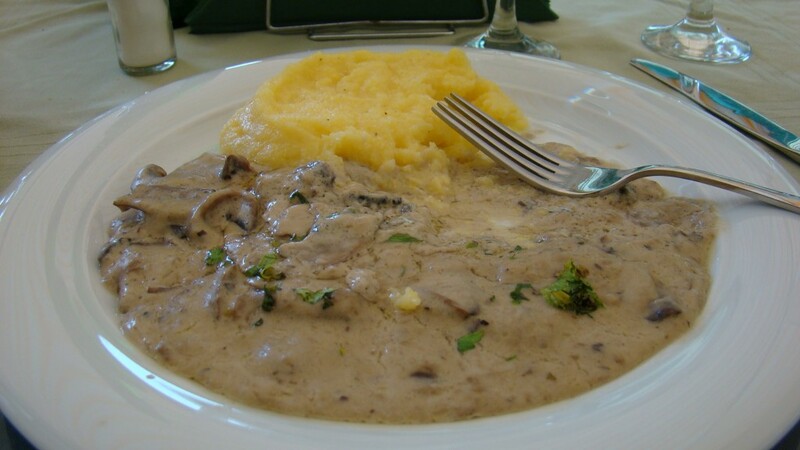 If you’re interested, you’ll definitely have to come to Umbria to try this one. 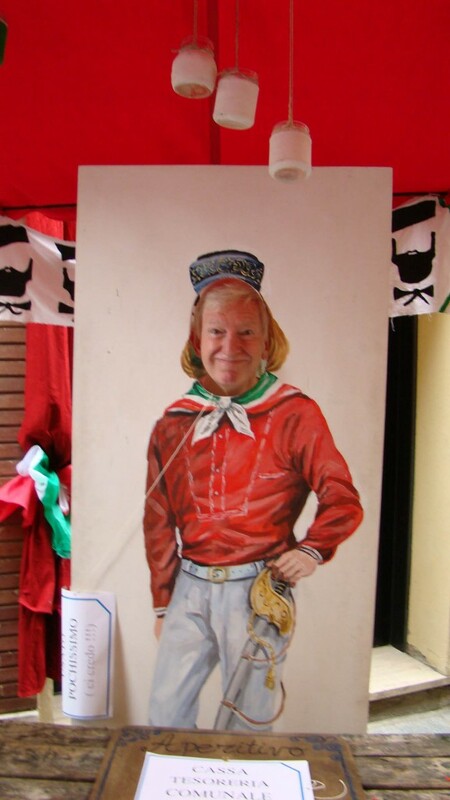 I don’t think much gets past the Umbrian border. Devis rounded the tasting out with Romanelli’s 2013 olive oil on slices of toasted bread. Heavenly. The oil was a greenish-gold with a strong hint of straw and a vegetal note that was just right. Although Romanelli is justifiably well known for its wines, it is also a major, prize-winning producer of olive oil. The weather last year was so bad that the entire crop was wiped out. Devis assured us that this year, which has been hot and very dry, the prospects of an successful season are very high. Nancy was very enthused. She has already planned a visit for us in November, when the new oil comes out. Details at that time. Finally, a short note for my grappa-loving friends. 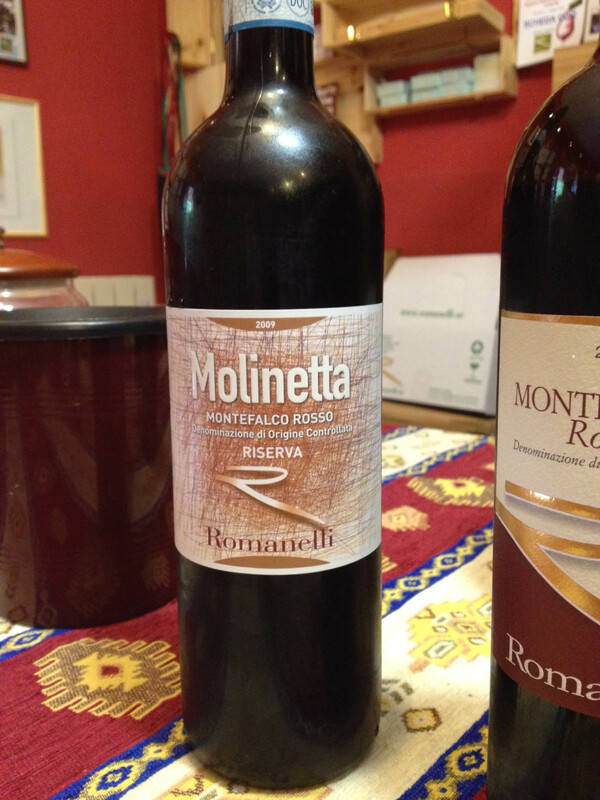 Romanetti makes a Grappa di Sagrantino that is one of the best grappas I have ever tasted. It was unusually smooth with a magnificent finish, completely lacking the sometimes oily character and schnapps-like bite that grappas can have. Grappa production by vineyards was hampered for many years by Italian laws forbidding winemakers to sell distilled spirits, effectively separating the wine business from anything to do with grappa. Those days are fortunately over now, and vineyards such as Romanelli are working hard to produce grappas of an equal quality to the wines they make. Lucky for us! 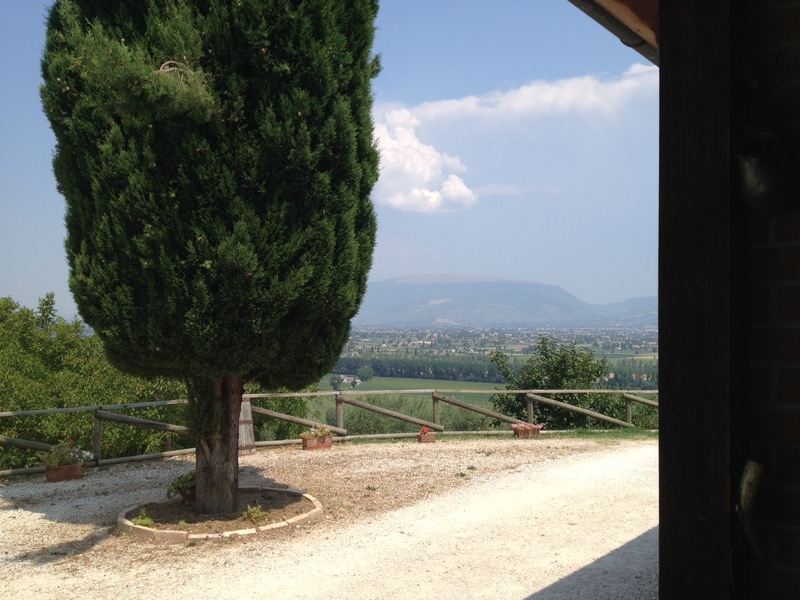 This entry was posted in everyday life in Umbria, Umbria, Uncategorized, Wine and wineries on September 16, 2015 by Nancy Hampton. Well it was four days of mayhem…fun mayhem. I got out and about more this year. My friend Michelle being involved got me more involved. I hung out with the briganti bad boys and girls. Luther and I went out one night and ate dinner in one of the venues. I felt this year it was a more authentic 1800s experience. All the entertainment was what you would expect in the 1800s. Juggling, magicians, stilt walkers. It seemed more people were in costume this year. Maybe the drag queens were a little out there but hey! They had fun too! I did my duty and snapped some pictures. 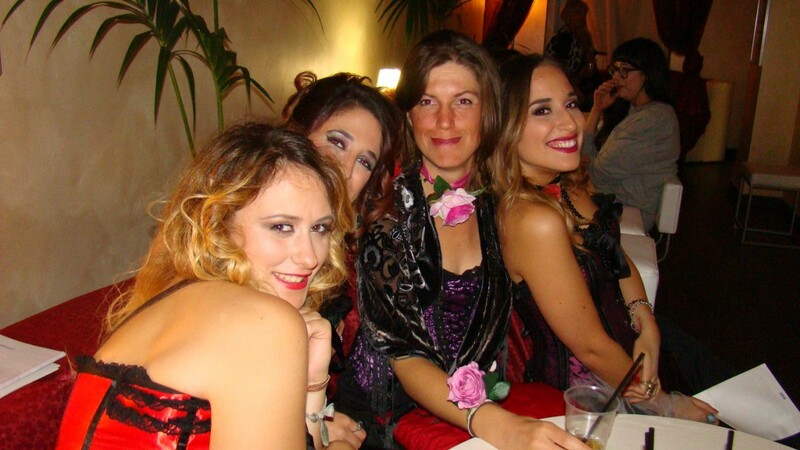 Michelle and her brothel friends. 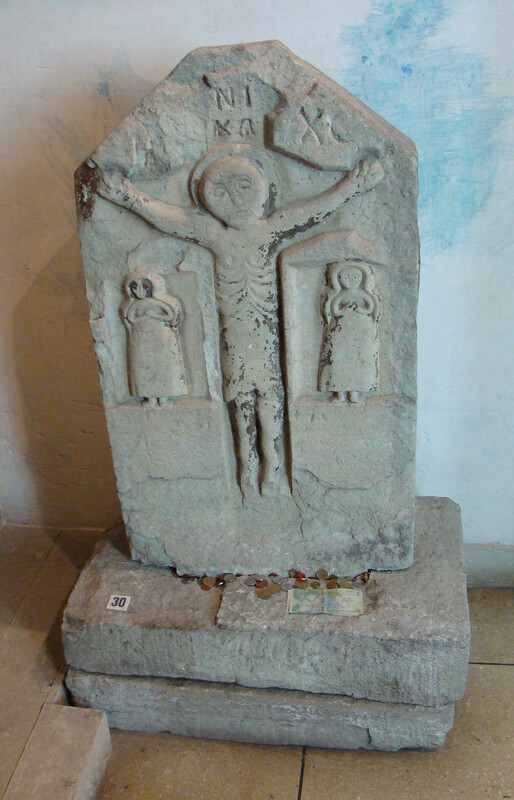 One of the briganti. See his gun? I noticed one waitress who had an ammo belt on. Another showed me her pearl handled revolver which she kept tucked in her waistband. Drag queen. Two of them did a choreographed dance in one of the bars. 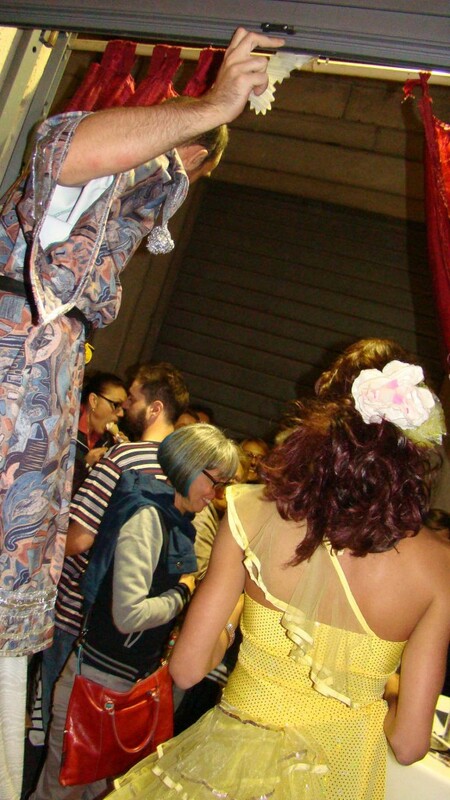 One of the stilt walkers who wandered the streets. I woke up at 4:30 AM to catch the briganti at work doing their worst to shock and appall. Last year I put in pictures but I thought I’d just link to these pictures. I need not describe them here but they are pretty raunchy but lovely workmanship. The first picture was taken at 4:30AM when they were setting it up. The second picture was the finished product in the light of day with the supporting structure. I will say, this was gone by 9:30AM when the police and town workmen showed up. Hah! Taking credit for their work! 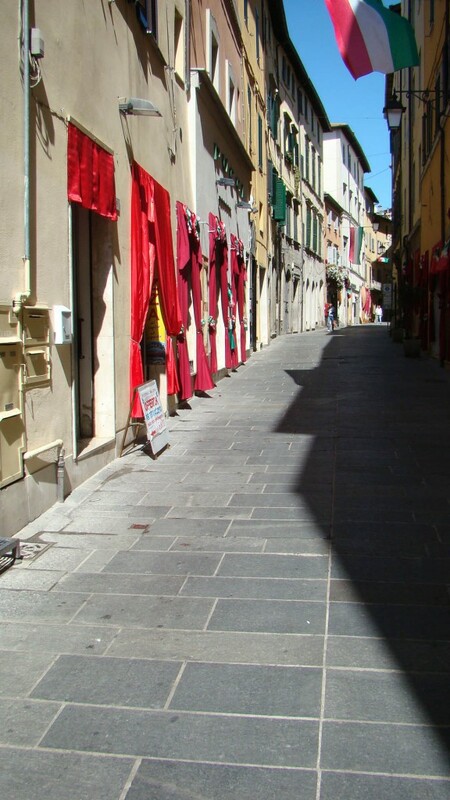 This entry was posted in everyday life in Umbria, Festivals and Sagras, Umbertide, Uncategorized on September 14, 2015 by Nancy Hampton. We saw our most recent guests off yesterday. 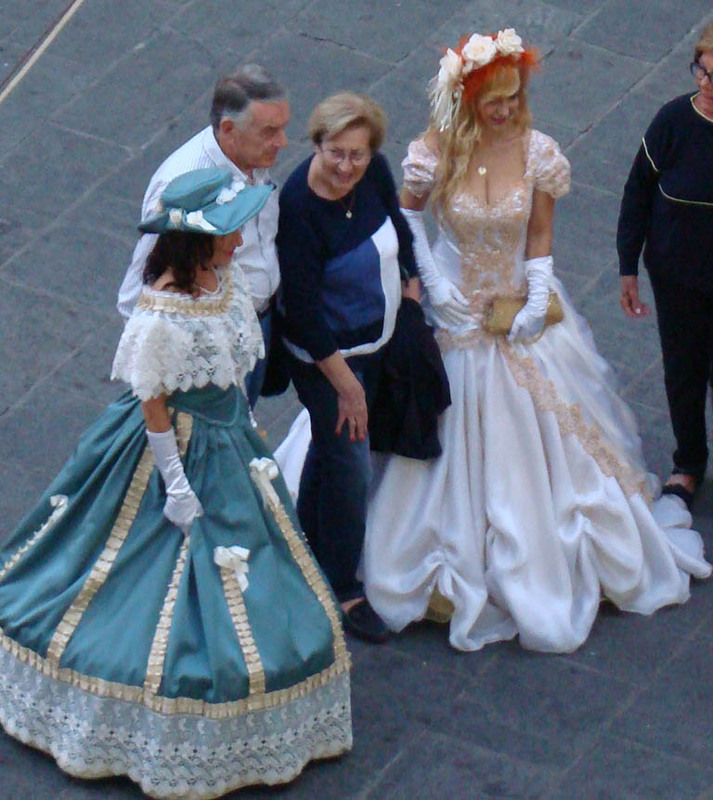 Ron and Linda live in Florence. We picked them up at the train station. It was a spectacular day. 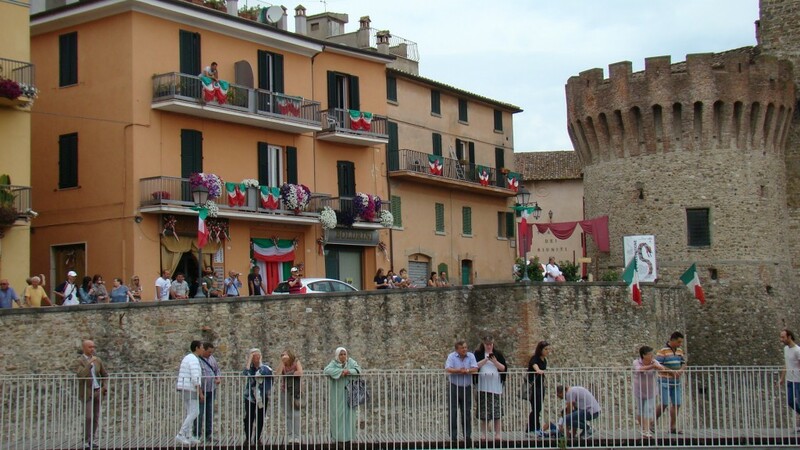 We headed to Castiglione del Lago for lunch at the Monna Lisa restaurant. We sat outside. 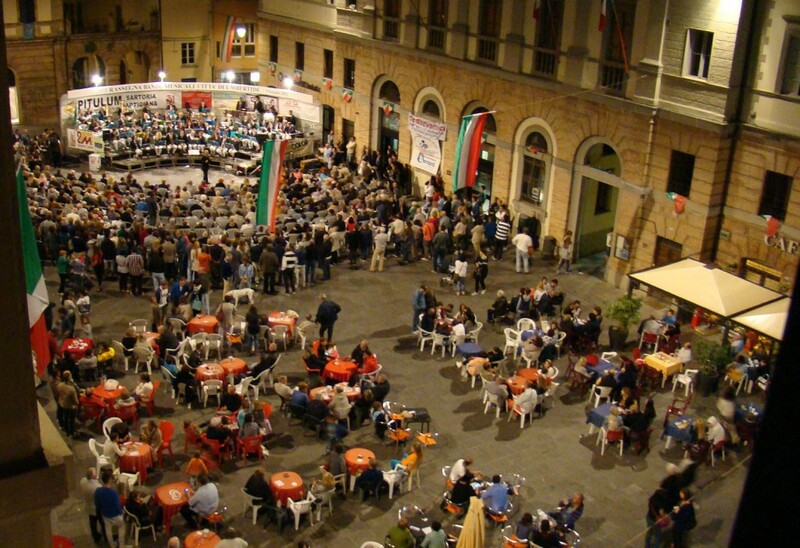 The food was good and we enjoyed watching the piazza. We headed back to Umbertide over the mountain pass above the lake. 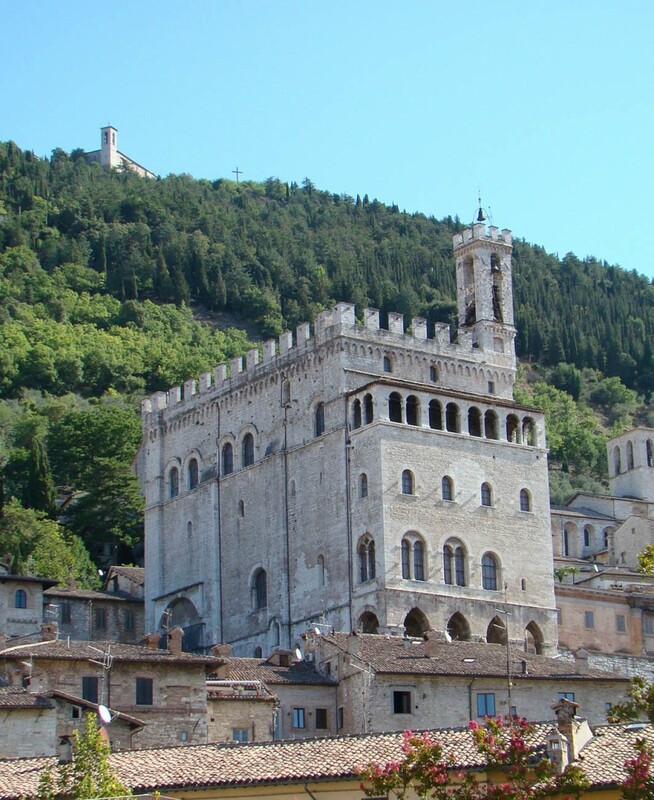 The next day we went to Gubbio. Again a spectacular day. 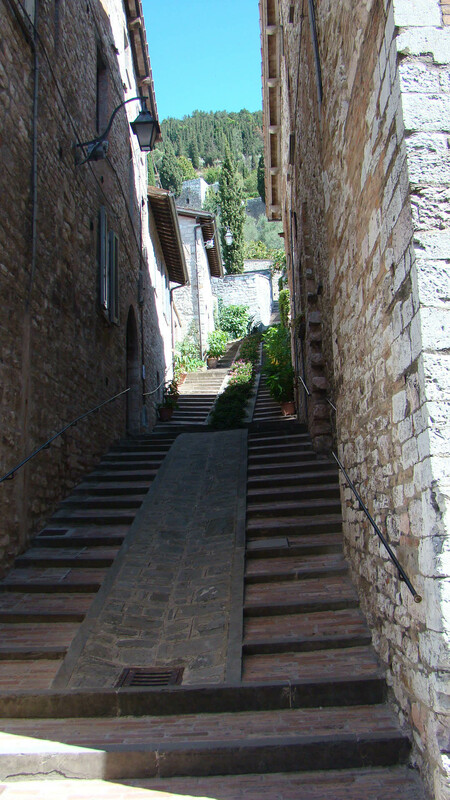 Ron and Linda travel by trains and busses and Gubbio is darn near impossible to reach that way. 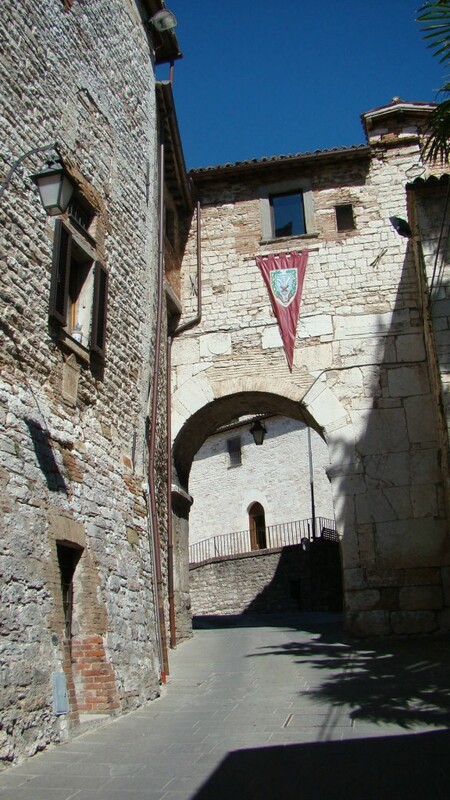 Here are a few pictures in Gubbio. It was such a perfect day I snapped quite a few. The night before our guests left we were treated to a concert. The town was really rocking last night! 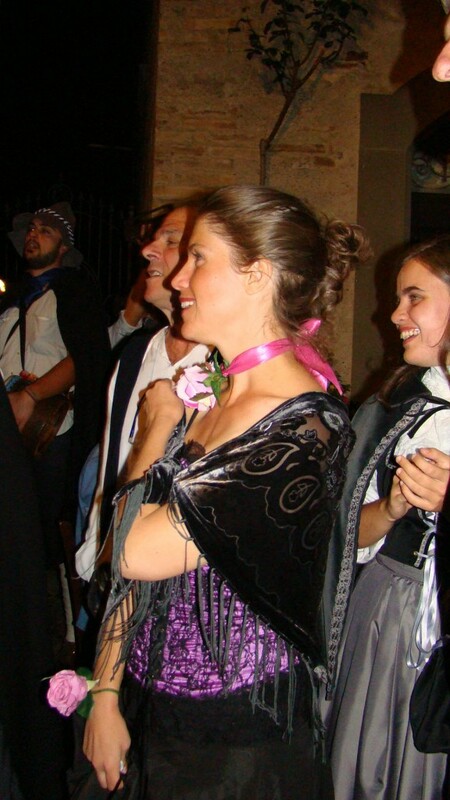 Our friend Michelle volunteered to be a “lady of the night” at the Bordello. She was cute in her bustier and flowers at her throat and wrists. More to come… Otto Cento is four days long. 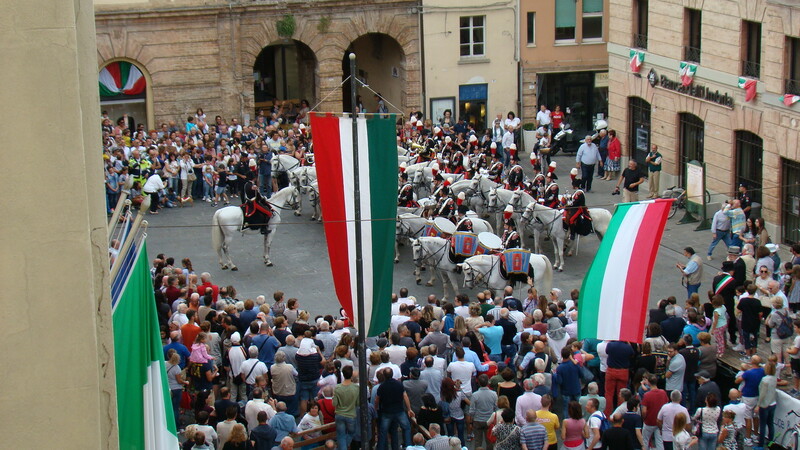 This entry was posted in everyday life in Umbria, Festivals and Sagras, Guests, Travel, Umbertide, Umbria, Visitors on September 12, 2015 by Nancy Hampton. I think I am going to have to start a separate section for weddings. Last Sunday I heard the sound of the Wedding March and took a look outside. The bride was surprisingly wearing orange. 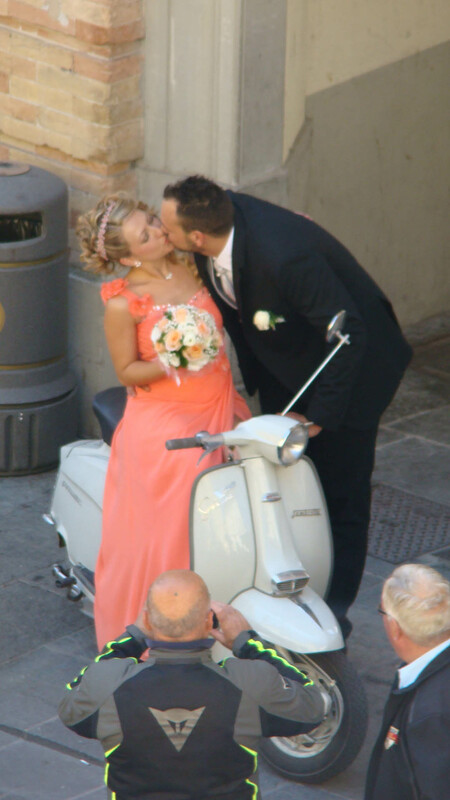 And I noticed there were a large number of Vespa motorbikes in the Piazza. Days later I finally made the connection. 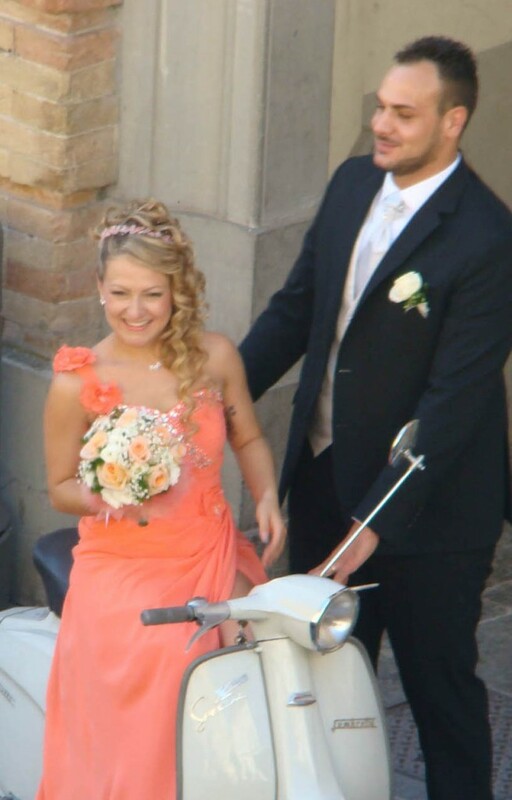 Orange is the color of the Umbertide Vespa Club. I surmised that the bride and groom are members. It was reinforced by the fact that she sat astride a white vespa to have her picture taken. Sweet. 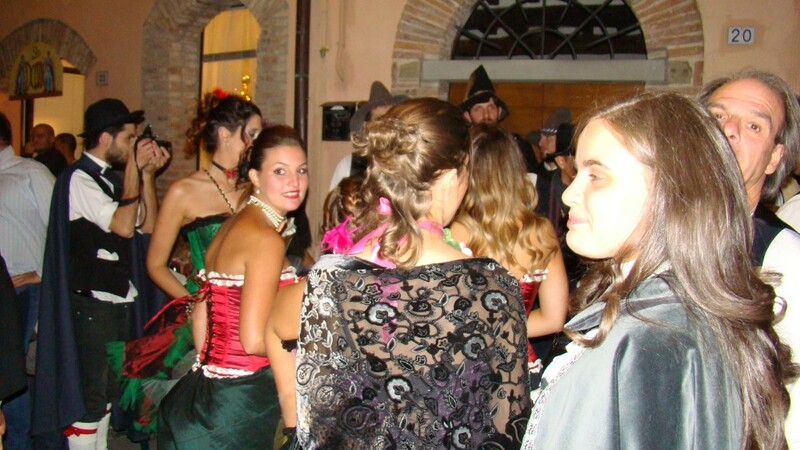 This entry was posted in everyday life in Umbria, Uncategorized, weddings on September 11, 2015 by Nancy Hampton.